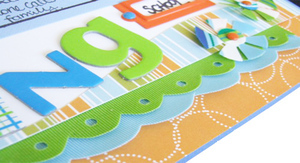 we know that grungeboard comes in a variety of fabulous designs and alphabets, and can be used fabulously and effectively on cards and scrapbook layouts. but we wanted to explore the very limits of this versatile product, and so we challenged our design team to come up with new and amazing ways of using the grunge. 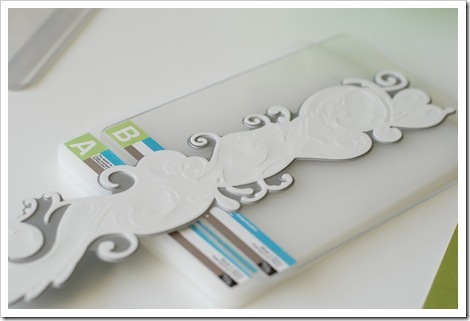 they have explored ideas for using the full sheets of grungeboard as well as the die cut alphas and shapes. we hope you enjoy what they came up with - i know i did! 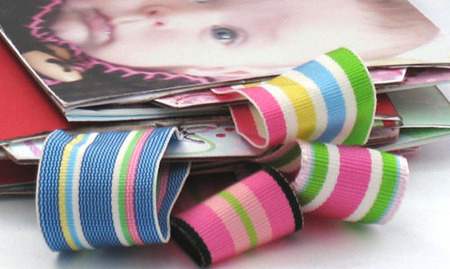 This mini-purse is the perfect little spot to hold children's little treasures. 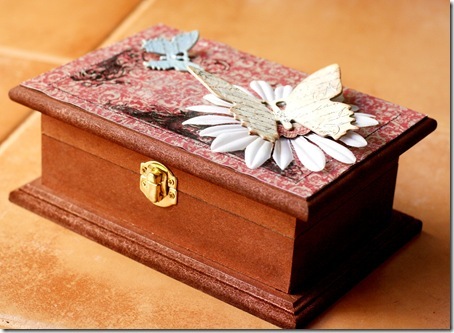 Donna made this one for her youngest daughter who loves to pack small toys and jewelry whenever they head out of the house. 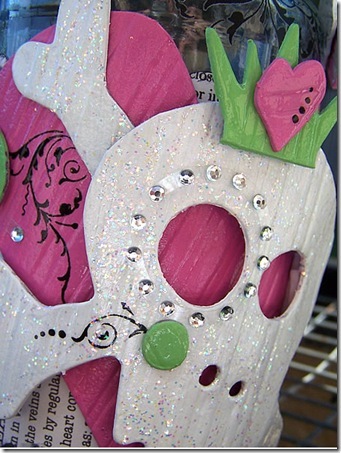 The fact that it is made from Tim Holtz new Grungeboard, means that it is extremely sturdy and flexible. The material itself is not unlike leather and Donna says that had she more patience, she could quite easily have stitched the sections together with plastic or leather cord. The unique 'leather-like' quality of this new product could actually lend itself perfectly to a whole plethora of similar projects. 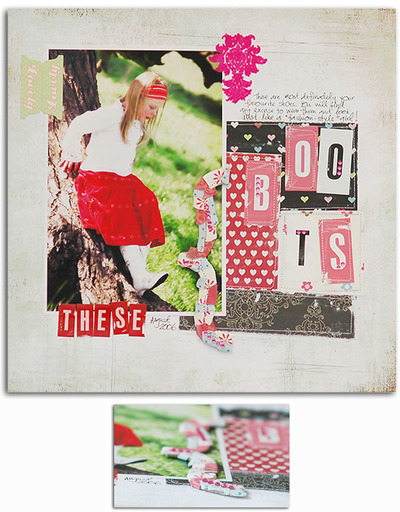 With bucket loads of free downloadable templates all over the web, the possibilities are literally...endless! Many scrappers have asked why grungeboard is better than chipboard - for Jaimie the answer is easy - grungeboard's unique ability to take the toughest treatment and still look good. 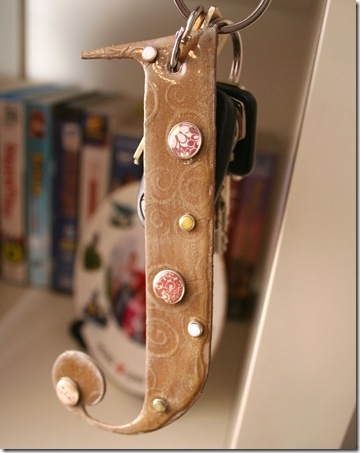 For this reason Jaimie decided to create a keyring embellishment for her car and house keys using the large grungeboard alphas. After mixing some paint and crackle medium and allowing the project to dry she then sanded over the swirl design and edges to give a shabby feel. 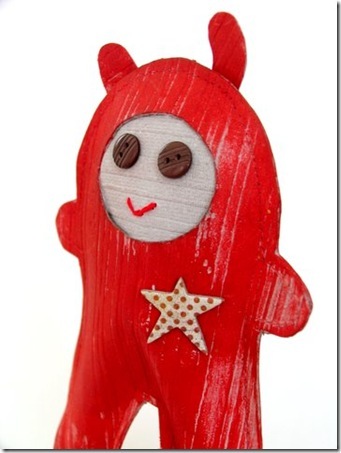 Mel also wanted to create something to show the true flexibility of the Grungeboard for this challenge, so she had a go at sewing this little Cosmonaut Devil. She adapted the pattern slightly (out of her 'Softies, 22 friends for you to sew, knit and crochet' book) to fit the sheets of Grungeboard, adding a Basic Grey Archaic chipboard sticker on the Cosmonaut's suit and some Basic Grey buttons for eyes. The Grungeboard sews beautifully (much nicer than stitching through chipboard she reports) and was very easily stuffed (with a mix of stuffing and newspaper). A splash of paint and our new alien friend was finished and ready for his photo shoot. 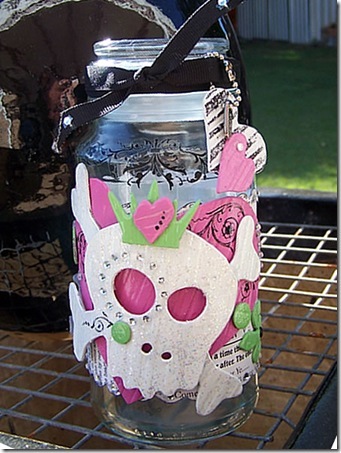 Carole made this Princess Skull Jar for her daughter's hair bands. 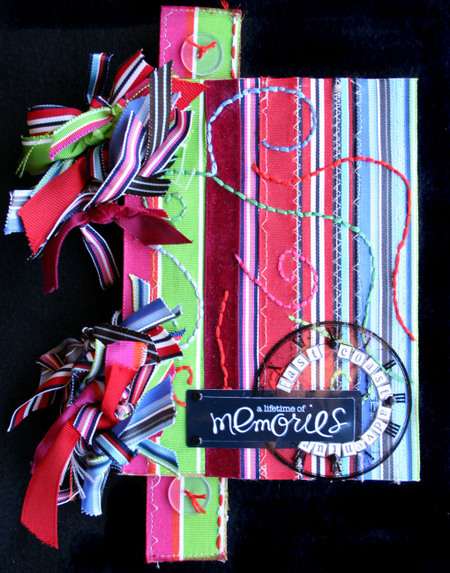 Carole loves the Element Stripe Grungeboard and she used it in several ways. 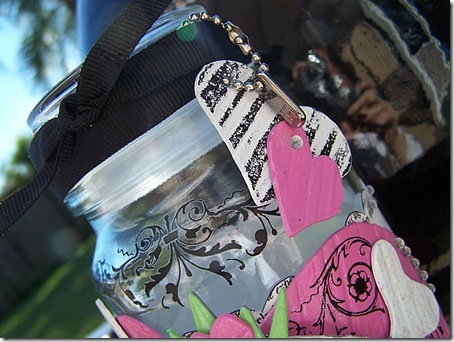 She painted and glittered and inked grungeboard shapes and also applied rubons onto the grunge as well as on the jar itself. Carole also used dimensional magic and still curved the grungeboard around the jar without cracking the dimensional magic. 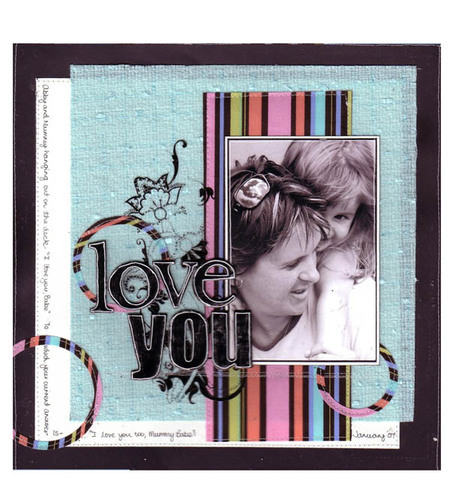 Carole used Carolee's Creations Love Pattern Paper as a base for the grungeboard, being black and white it worked really well. 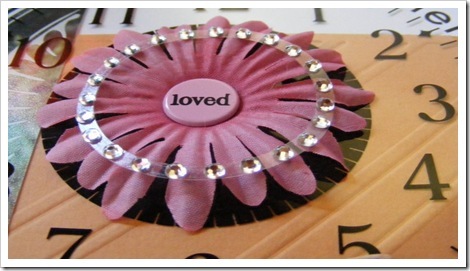 She also used Heidi Swap bling circles for added glitter. 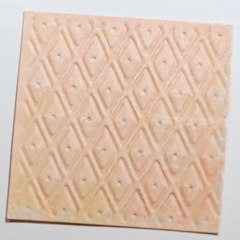 With this example, Nic covered the Stripe Grungeboard with Pink Paislee paper and pressed firmly to ensure good contact between the paper and the liquid glue. 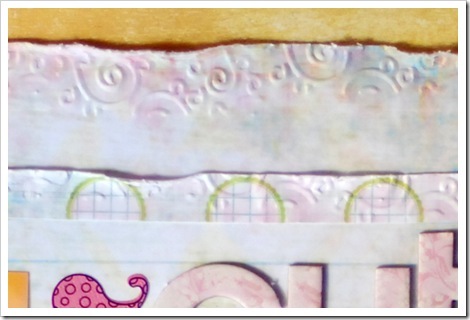 By lightly sanding over the patterned paper, Nicole was able to give the projects a wonderfully worn feel as the sandpaper picked up the ridges of the grungeboard. 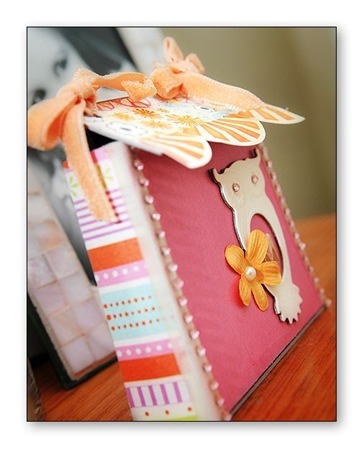 Nicole made this cute little photo folder by machine stitching pieces of covered Grungeboard together and hinging with layers of paper. 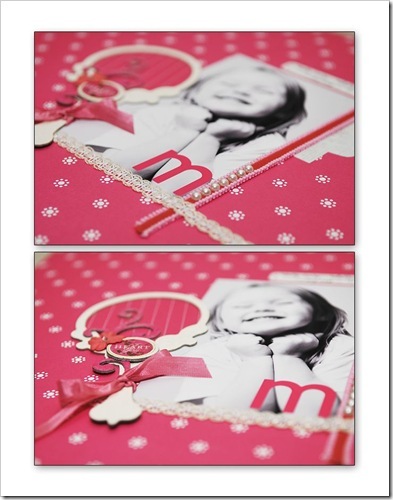 She finished the front with Cherry Arte Morocco rub on letters and a Heidi Grace ribbon tie. 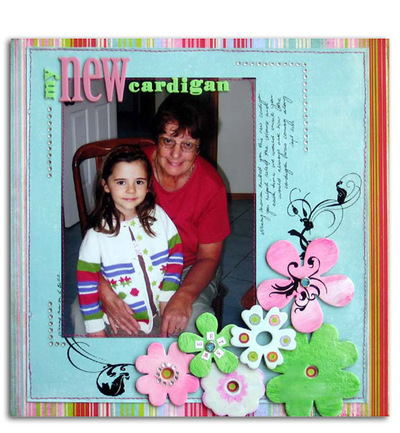 This idea would be a wonderful gift idea or a nice way to present photos to a friend or relative, and was quick and easy given how easy it is to machine sew through Grungeboard. The flexibility of the board also allows you to bend pockets inside without the risk of tearing like you would find with normal chipboard. Nicole was so impressed with the leather-like qualities of Grungeboard that she thought it might be fun to use it just like leather. 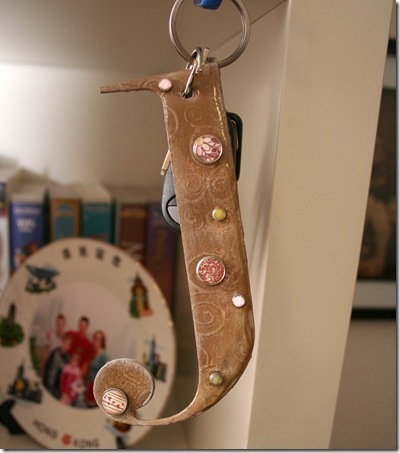 With addition of a few fabric eyelets, a D-ring and some leather thonging, Nic was able to create this funky necklace that would be perfect for your favourite teenage (or older) recipient! She covered the Grungeboard skull with CherryArte paper and then sprayed with red Glimmermist before punching with a Crop-A-Dile and hanging on the D-ring. Grungeboard would have to be one of the most versatile products on the market. Folding, distressing, painting, inking and misting are only a few ideas to alter this remarkable product. The best thing would have to be that no matter how 'brutal' you are with grungeboard it always bounces back. 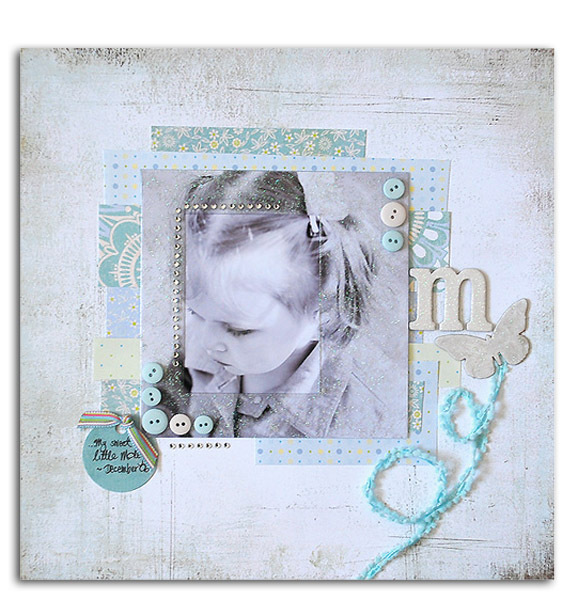 A little crackle medium and paint create a lovely vintage look to the grungeboard elements on Jaimie's page, once dry she rubbed an ink pad over the embellishments to give that extra 'pop' to the crackle. Suz can't get past Glimmer Misting her grungeboard. She loves how the glimmer settles into the crevices of the embossed grunge. 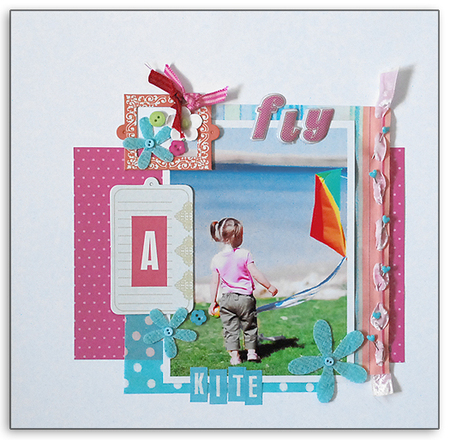 In this layout she sprayed the Alpha Stripes with three different Glimmer Mist colours - Watermelon, Pearl and Kiwi and both inked and outlined the edge of each letter. She then intertwined flourishes from the Elements Grungeboard pack into and around the letters which is so easy to do given the Grunge's unique flexible properties. 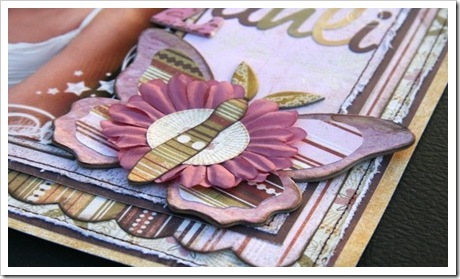 Your local scrapbooking shop is bound to have some Tim Holtz Grungeboard in stock, so go check it out. If they don't - ask them to order some in for you!! Glimmer Mist, a Tattered Angels original product, is a quick and easy spray that delivers just a touch of glimmer in a fine mist to make all of your projects shine. 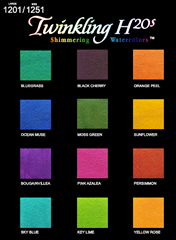 Glimmer Mist puts an end to messy, clumpy, and time consuming conventional glitters with over 50 colors to choose from so finding the right one for your project is easy. 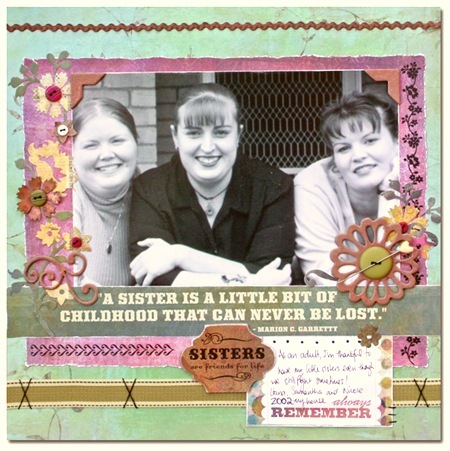 Glimmer Mist was made by a scrapbooker with the scrapbooker in mind and is water-based, archival safe, acid-free, and non-toxic. 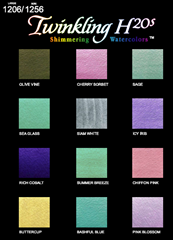 Glimmer Mist is safe for and adheres to all types of materials including paper, acrylic, metal, and fabric. Chris said she loved playing with the Glimmer Mist. 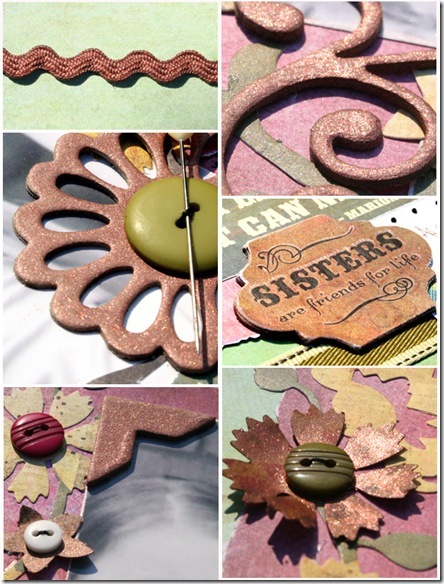 She chose the colours Juneberry Wine and Antique Brass to experiment with. 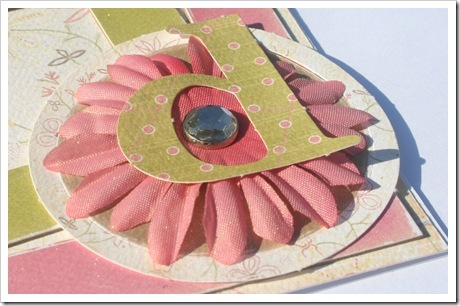 Chris dug up some of her old Pressed Petals Chip Chatter letters and made them funky and new with the Glimmer Mist. Chris sprayed the Juneberry Wine Glimmer Mist onto the letter. For the large 'Z' Chris held the sprayer closer to the letter and the result was a darker colour on the letter. For the smaller 'Z' she held the sprayer further back and also used a paint brush to wipe off excess spray. 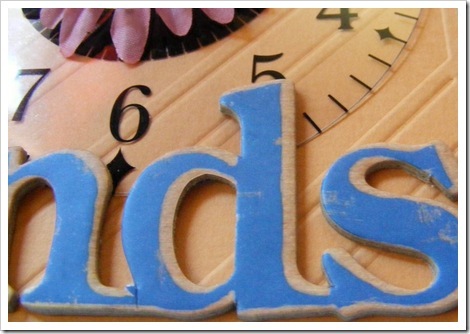 Chris also lightly sprayed both letters with the Antique Brass Glimmer Mist to give them an extra sparkle. 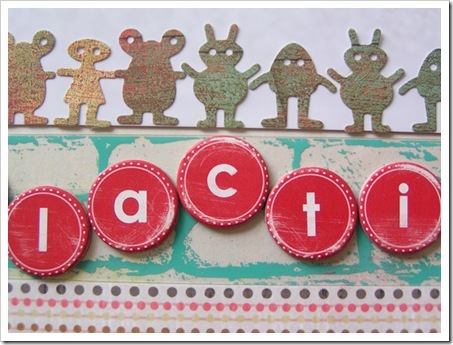 She then stamped the Hero Arts Old French Writing stamp onto the chip chatter letters using a brown ink. Chris also used a VersaMark resist technique on the chipboard butterfly. 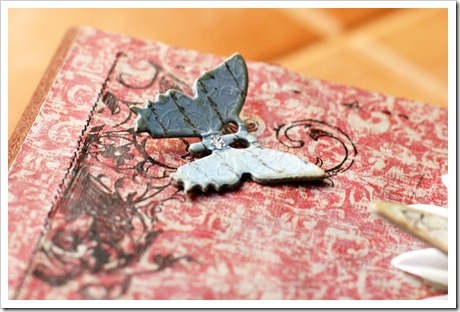 She used the Old French Writing Stamp with the VersaMark ink cube to stamp onto the butterfly. Once that was dry she then sprayed over it with the Juneberry Wine Glimmer Mist. The result was a little different on the butterfly as it has a shiny surface opposed to the Chip Chatter letters which have a rougher surface. Finally Chris also altered a Heidi Swapp flower to co-ordinate with the rest of her layout by spraying it with the Juneberry Wine Glimmer Mist. This classic black and white photo of Donna's youngest daughter needed a no fuss background to really make it pop! 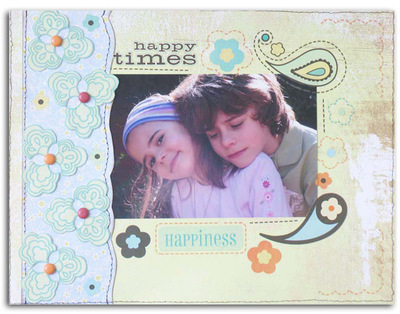 Donna used the fabulous new Glimmer Mist in Graphite to create her own patterned cardstock simply by laying a piece of Junkitz felt fusion over the cardstock as a makeshift mask. The result is something completely original and unique. By adding a little doodling to highlight the masked area, Donna's layout has become something more than just a stock-standard page. This page will be treasured. It's well known that Suz never misses an opportunity to create a rainbow, and when she was sent a stash of little sample bottles of Glimmer Mist in a range of colours, it was just too tempting. 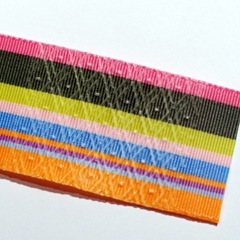 Spraying it in small areas over a length of cream Queen & Co Celtic Felt Fusion produced exactly the effect she was after - a beautifully muted and slightly sparkling rainbow length of felt. 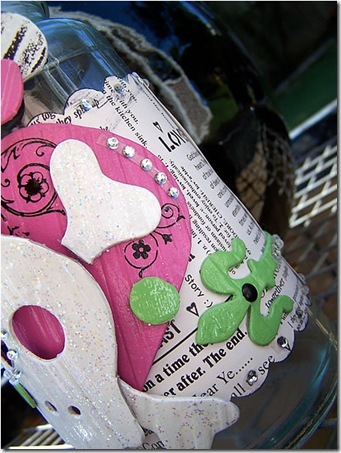 She also had a field day spraying it on a range of Tim Holtz Grungeboard butterflies and alphas and loved the way the Grungeboard absorbed the colour but the very fine glitter the Glimmer Mist contained settled into the crevices of the embossed Grungeboard, accentuating the design. Finally Suz exagerated the dreaminess of the layout by spraying directly onto the SEI Chickadee patterned paper creating subtle areas of light and shade. Sometimes you just need that right shade of paper to finish off a layout perfectly. When you don't have the correct shade in your stash, Glimmer Mist is fabulous to use - just whip up your own piece to complete the layout. Simple spray the Glimmer Mist over a piece of white paper or card, leave to dry and adhere into position as Mel has done here. It gives such a luscious, glimmery feel to the page. Nic used Glimmermist on many different surfaces and it really added to the vintage-feel of the Cosmo Cricket Fleuriste range. 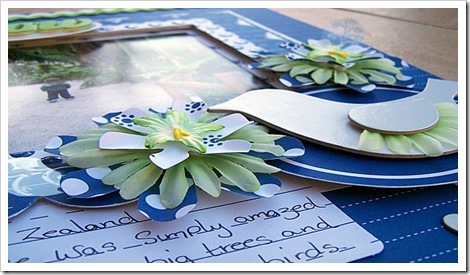 She has used it to colour white ric rac, to add a thin layer over the die cut flowers and also to cover chipboard pieces. Nic's favourite thing about the Glimmermist was that you have contol over the opaque-ness of the mist and best of all it sits on top of non-porous surfaces. 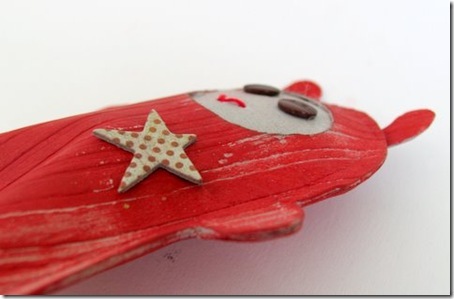 It left a gorgeous sparkle on ricrac and chipboard without being completely absorbed. 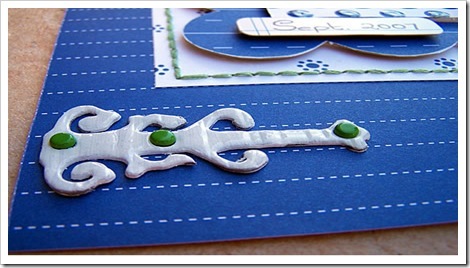 Add a touch of glamour to your handmade cards by giving them a quick spray of Glimmer Mist. Caz used Antique Brass which gave this Crate Paper card a subtle all over sparkle that is pretty without being over the top. 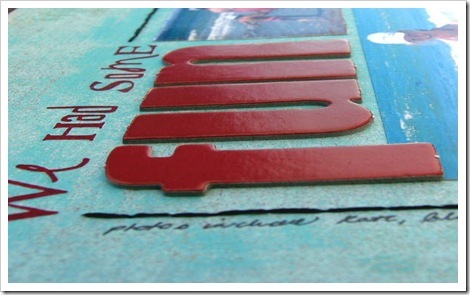 To create this effect on a chipboard frame, Chris used the Li'l Davis paint to randomly brush over the frame. When the paint was dry she then sprayed the Juneberry Wine Glimmermist and Antique Brass Glimmermist over the frame. 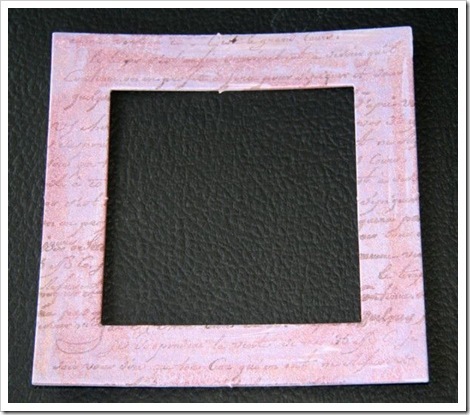 Once it was dry Chris used the Old French Writing stamp with brown ink to stamp onto the frame. 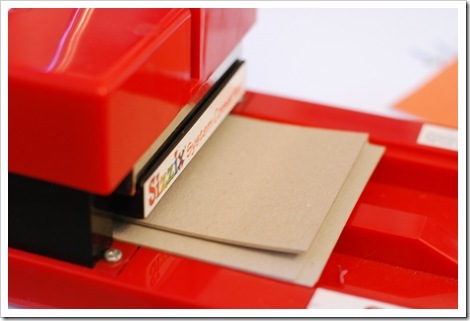 Though obviously we like the Quickutz Revolution the best, we do acknowledge there are other die cutting systems out there, and you might well have one tucked in a cupboard or under your scrapping table. 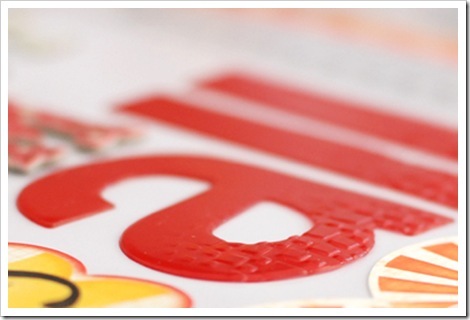 And because Quickutz have have such a massive range of dies and are regularly releasing even more funky shapes and gorgeous designs, we don't want you to miss out on just because you have someone else's die cutting machine. At the end of the day what they all do, one way or another, is squeeze the dies and your chosen paper together so that it cuts your chosen shape. 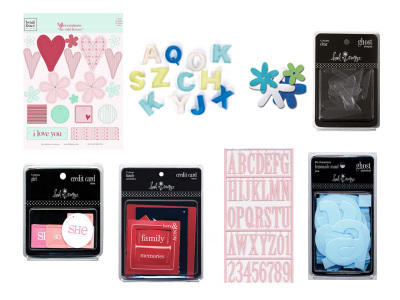 So we've had a play with some of the other die cutting machines on the market to show you how to quickly and easily you can use coveted Quickutz cutting and embossing dies on the machine you already have so so you don't have to miss out! Literally as easy as 'ABC'. Instructions for using Other Brand Thin Dies are in the manual, and the adaptor plate (marked C) that you need comes in the box. At the bottom you need your Spacer (A), one Cutting Pad (B) then you place your Quickutz die, your patterned paper and finally your Thin Die Adaptor (C) and roll the lot through the machine. We found this cut easily and cleanly even through the two layers of the self-adhesive Quickutz Stripz. 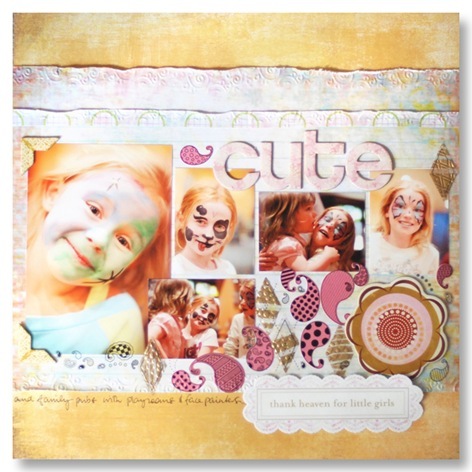 The Cuttlebug will take up to four 2" dies or one 4" die. The question on Cuttlebug owner's lips who has seen the new 12" border dies released recently by Quickutz would be can I use these in my machine, and if so, how. The answer is yes. Use the same set up as above with the die resting on A and B. Cover the die with your paper, and cover this with Adaptor Plate C. As you can see obviously the plates are not long enough to cut the whole die at once. Roll it through until it comes out the other end. Now making sure you keep your your die and patterned paper together, move the plates to the other end of the die, and roll through again. You will probably need to do this from the other end and roll into the middle, rather than starting in the middle and rolling to the end, as I found the machine didn't want to accept the bulk of all the layers at once. And there you have it. 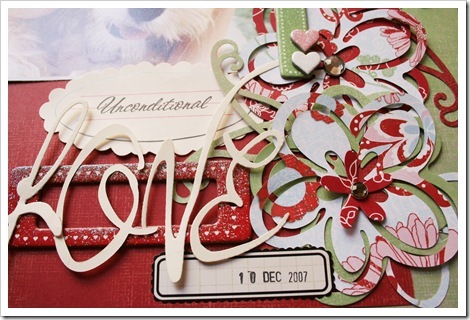 The beautiful Quickutz Cookie Cutter Flourish cut on the Cuttlebug. It's not a perfect setup, but it's certainly do-able. 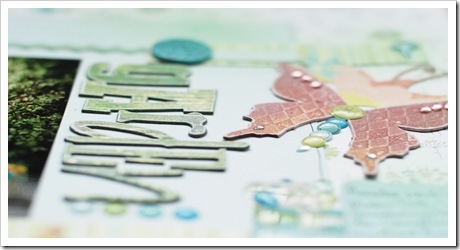 This is easy enough but the widths of the embossing dies means you need to do a bit of tweaking. The above ABC set up is too thick to send the embossing dies through, and the ABB set used for Cuttlebug dies is too thin. 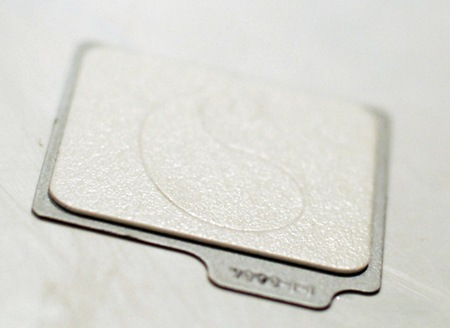 This can be quickly and easily solved though with nothing more technical than a sheet or two of chipboard cut to the same size as the plates. 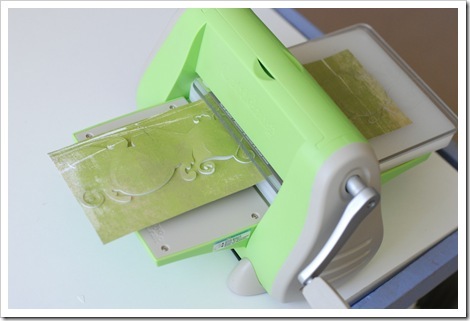 Fold your Goosebumpz Embossing Die over your chosen paper or cardstock. 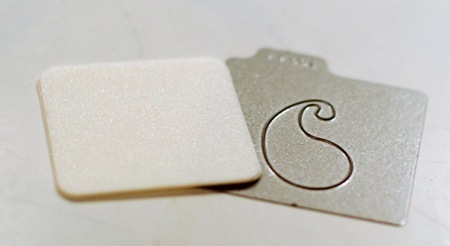 Place on the Spacer (A) and Cutting Pad (B). 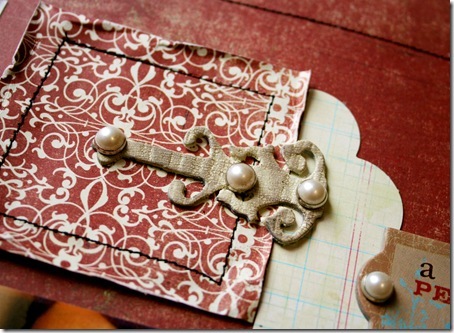 Cover with your second Cutting Pad (B) and one or two sheets of chipboard. 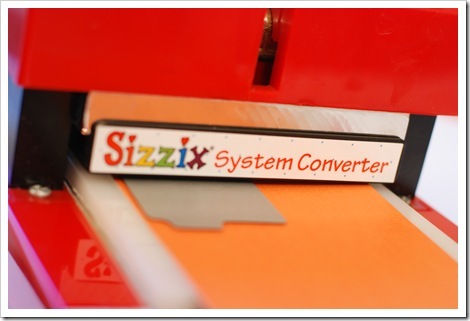 To use Quickutz 2" or 4" dies in the Sissix die cutting system you need both the Sissix System Converter and the Adaptor plate. If you don't have the Adaptor Plate (I didn't for the purposes of this report) load up layers of chipboard as shown. Test your system on scrap paper but I needed four layers under the cutting plate to give a clean cut. The 2" dies are small enough to be cut in one go. 4" dies will need to be moved along and pressed twice. 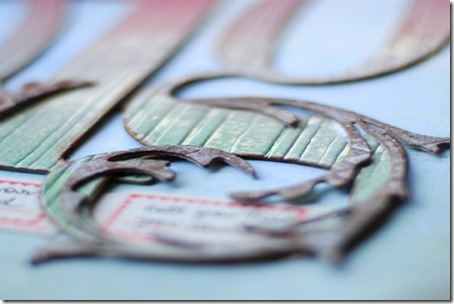 The gorgeous 12" border dies went through easily enough. This is the 12" Cookie Cutter Leafy Vine. You need to feed the length of the die and the paper through manually as this is not a rolling die machine, and you need to press about six times - and a few extra just be sure. Watch it as it comes out the end nearest the lever - you may need to turn it around so that you're not pressing down on top of the die. The fact that you can pick up your paper and die at any time to check whether it has cut through successfully though makes the system fairly foolproof. 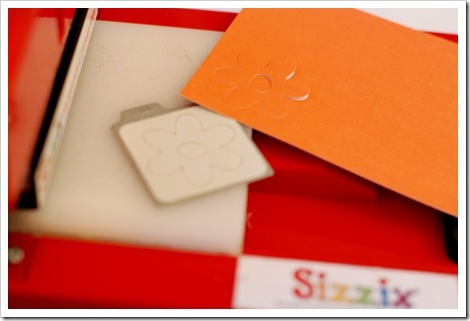 Again you need the Sissix System Convertor and either the Adaptor Plate or the high-tech chipboard layer alternative. The 4" die will need to presses but this gave a lovely clean imprint. 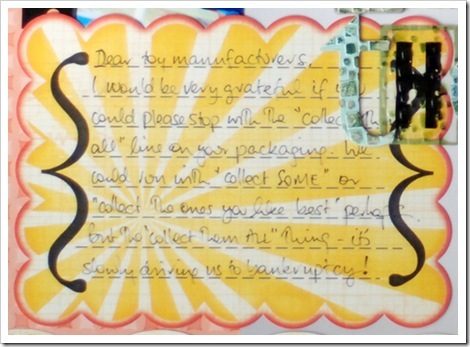 If you have any other queries, or have a different diecutting system we haven't covered here, we're happy to help. Leave a question in a comment and we'll look into it for you. 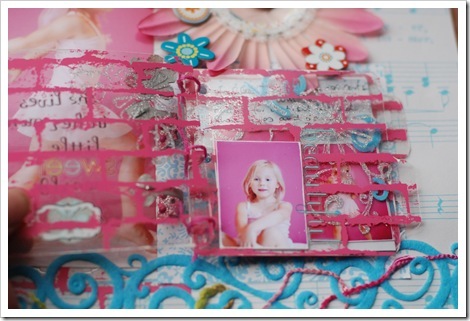 Layering diecuts is a great way to add dimension to a page and by adding double sided foam tape throughout the embellished corner Jaimie has given extra lift to her layout. 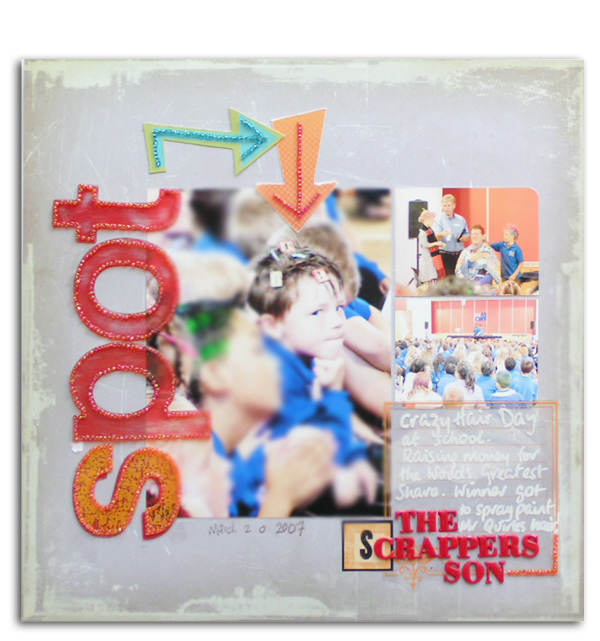 Jaimie adhered the diecuts onto a solid paper background to ensure the heavy embellished corner would not be swamped by too much colour - she has balanced her LO by adding strips of co ordinating paper in the opposite corner which leads the eye through the page to the title. 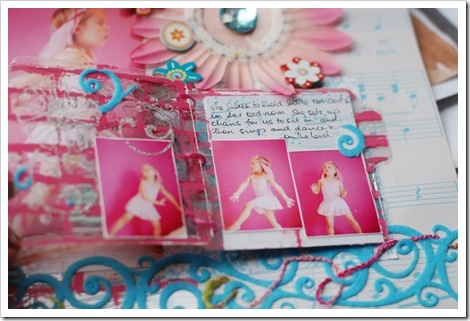 Suz has used the Quickutz Revolution 'Mini Album' die for this little book which was great for containing lots of extra photos of her daughter dancing and some additional journalling. She reports that the Hambly Transparency she used for it went through the Revolution just fine - which makes a fast and economical way of creating your own transparent albums! The Heidi Swapp floral may look slightly wonky but was actually embellished by her daughter who wanted to 'help' create this page. 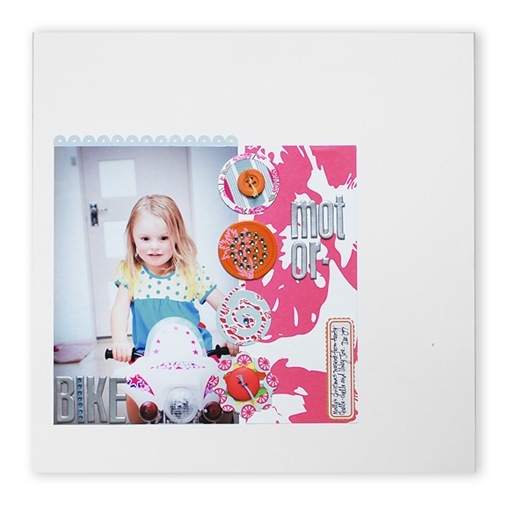 The Quickutz Revolution Big Centre Flower die is perfect as a frame for holding photos, as Mel has demonstrated here in her layout. 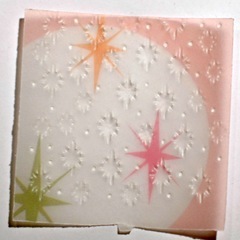 The edges of the flower (cut out using Sassafras Lass Indian Paintbrush patterned paper) were lightly sanded before the photo was placed inside. 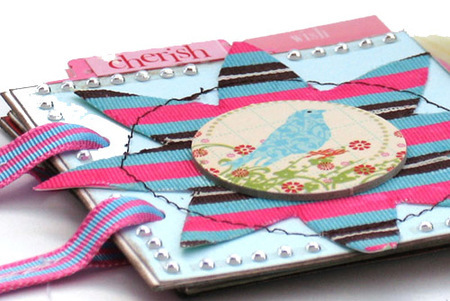 A perfect little addition to any layout! 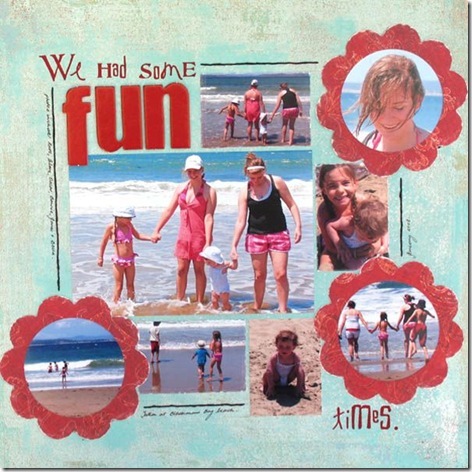 Another layout by Mel demonstrating the Quickutz Big Centre Flower die being used as a photo frame. 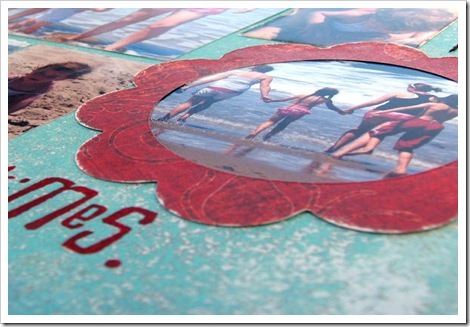 Mel has also used the Ribbon Flower die on each side of her layout to hold words relating to their day at the beach. 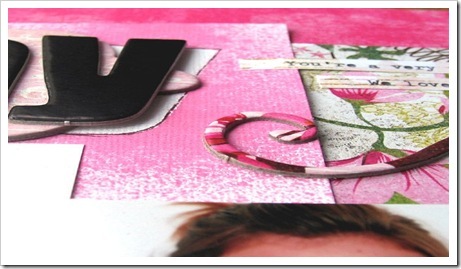 Caz used the Quickutz Revolution Embossing Die in the Stripes pattern to make this quick and easy colour blocked background for a layout about her eldest daughter Darcy's birthday flowers. She chose colours that matched some of the flowers and you must admit, it turned what could be a pretty average background into something special. 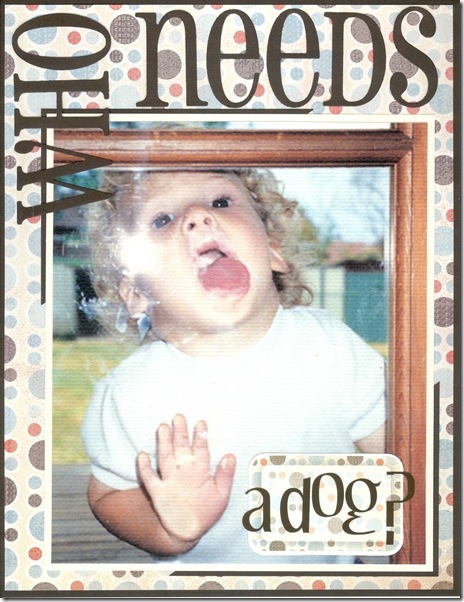 This photo of Caz's son Jesse really didn't need any journaling as she thinks it speaks for itself, Yuk! he's licking right where the dog usually licks the window. 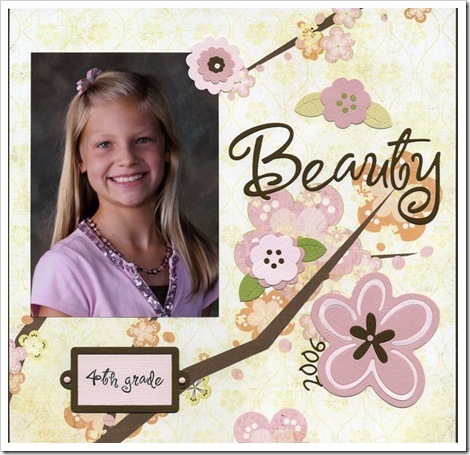 She simply chose to create a large heading using her favourite Quickutz Revolution font - Blossom and some Arctic Frog letter stickers. 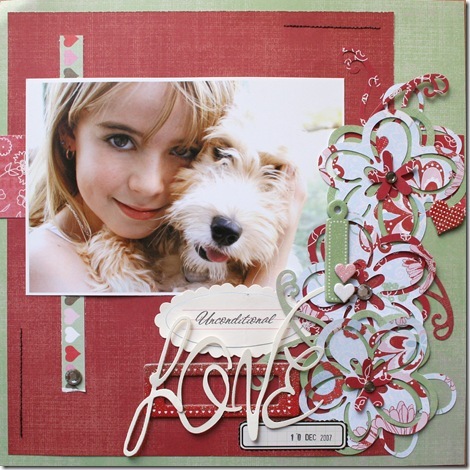 Thanks to Molly Smith for this lovely layout using Quickutz Revolution alphas and shapes. 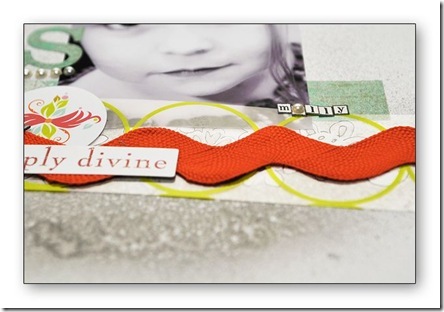 The fun Spicy Chicken font, whimsical flower shapes and the nameplate plus the beautiful BasicGrey Lilykate papers, highlight her granddaughter, Hannah Kate's pretty face. Molly has a large collection of Quickutz fonts (62 actually) and says that the Grand alphabets are particularly fun to work with. Over the next few weeks we'll be running a series of blog posts looking at the unique tools and dies and other products offered by Quickutz. 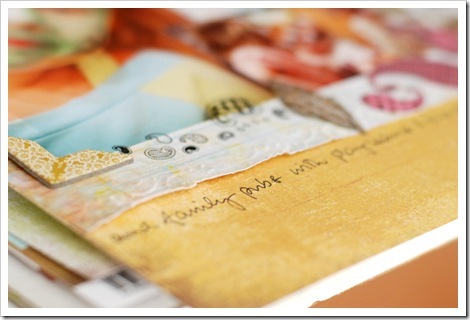 We'll be featuring in-depth how-to's as well as our usual inspirational layout and project ideas. 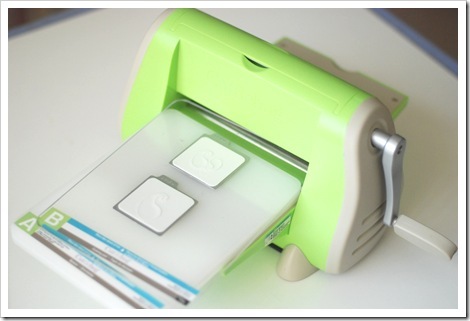 The QuicKutz Squeeze can be used as a hand tool or set up as a tabletop die cut press machine as shown above. When set up as a tabletop press, place the hand tool close to your body and use your body weight (lock your elbows) to push down on the top handle of the tool while you are standing. 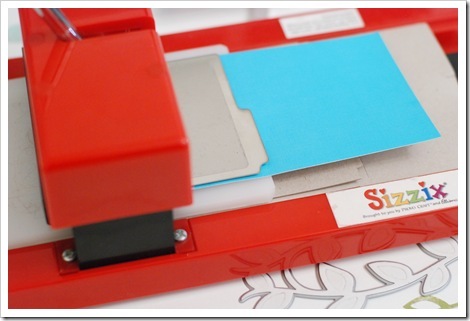 Squeeze is by far the sassiest, most stylish personal die-cutting tool on the market. 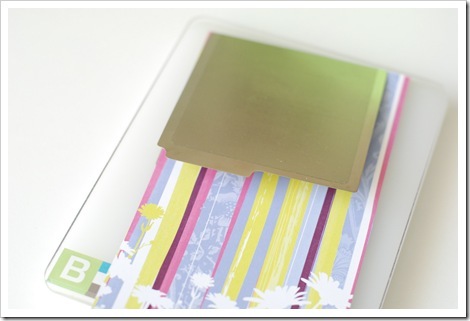 Its brushed metal finish and slender, sleek design give it a unique look you can be proud to carry with you to scrapbooking events! But don't let its fashionable look deceive you! Squeeze is also built-to-last! With no cheap, plastic parts and a lifetime service commitment, you have a friend for life! 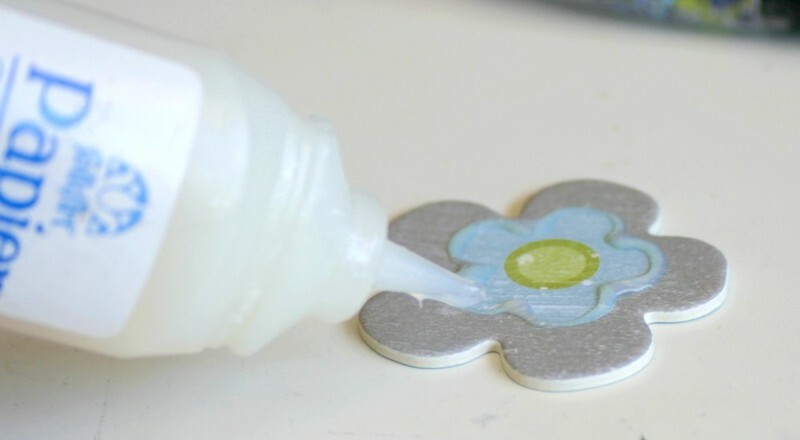 There are many innovations to come from QuicKutz that increase the versatility of your die cutting tool, such as embossing with GooseBumpz, QuickStampz (which makes it possible to create foam stamps from your dies) and Icing RubOns embellishments. 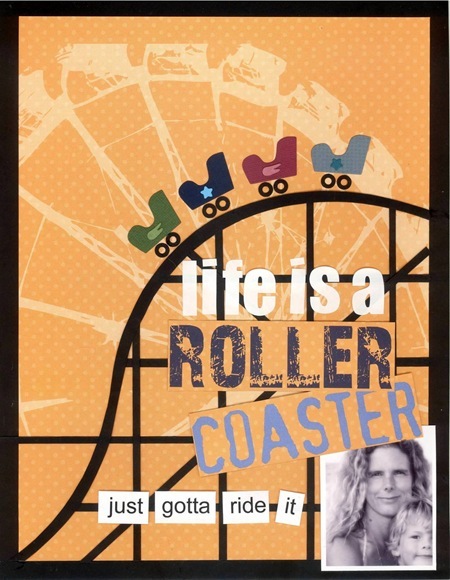 "It was a bit of a roller-coaster year, 2007. Unfortunately there were probably a few more downs than ups but I hope 2008 is going to be a better one. 2007 started well with our trip to the USA. Our first overseas family holiday with all 5 of us, actually our first REAL holiday which hasn’t involved going to the family holiday house in Nelson Bay. It was fab, and the kids all still talk about the things we saw and did over there. So worth it and such a good start. Jesse started Kindergarten, Jord went into Year 4 and Darcy into her final primary year, Year 6. Woo Hoo, all 3 kids in school and I have some free time to myself during the day. Next month Jesse is hospitalized with pneumonia. Not fun in the least and scary for us, no matter how cool he thought the hospital school and Starlight computer games machine was. But obviously he needed to see inside a few more hospitals. Within 3 weeks he managed to get hit by a car. 2 ambulance rides, 2 more hospitals and a fractured skull. Seriously, who would have boys?..." The Been There Done That - Theme Park Heaven paper makes the perfect backdrop against the black paper pieced scaffolding. 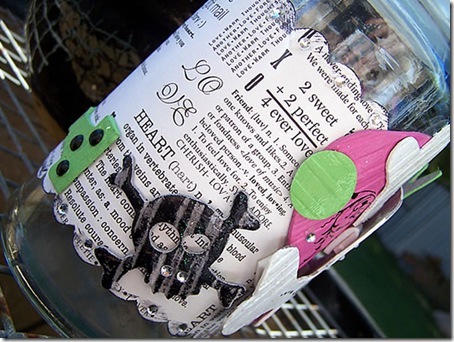 The Quickutz handtool is a very versatile little addition to any scrap tote, as this layout by Donna clearly demonstrates. 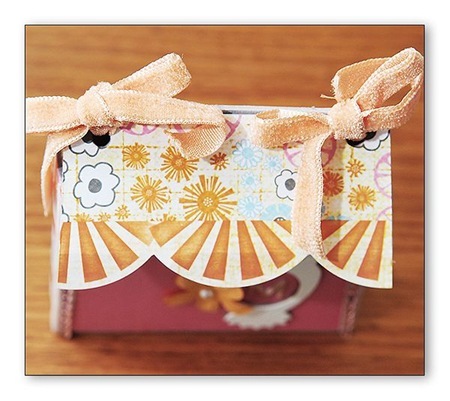 Donna used a simple circle die (from the Icing Rub-ons Starter Kit) to cut a couple of circles from 1.5" Strano ribbon and patterned paper. 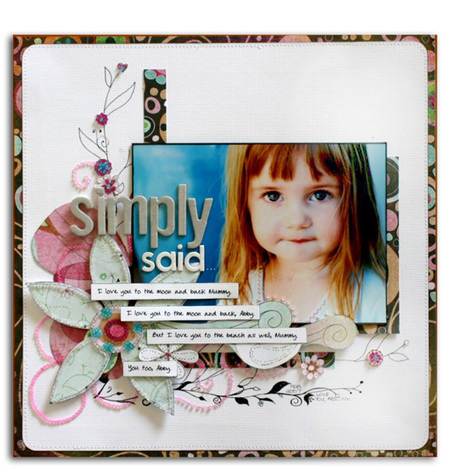 She further embellished those circles with a few bits and pieces to create a unique focal point for her page. 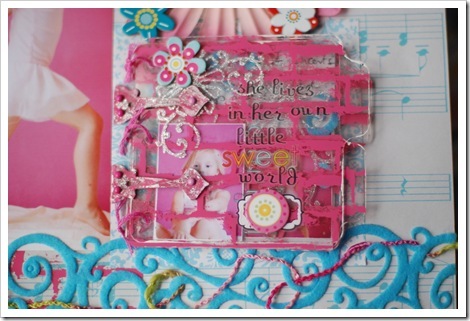 A lace die was also used to add a little 'interest' to the top of the photo of her adorable youngest daughter. 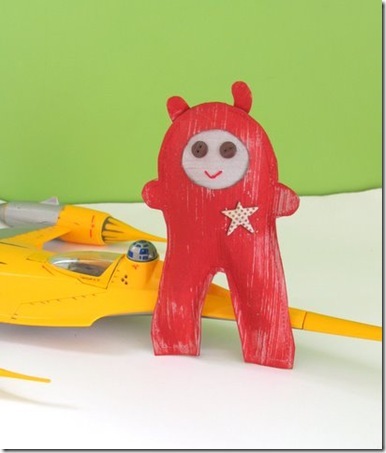 These very cute little guys are aliens, and Suz thought they were really the perfect embellishment for this layout she has created about her son's obsession with Star Wars Galactic Heroes. Two dies give you four different types of aliens and Suz has lined them up randomly like a border across her page. 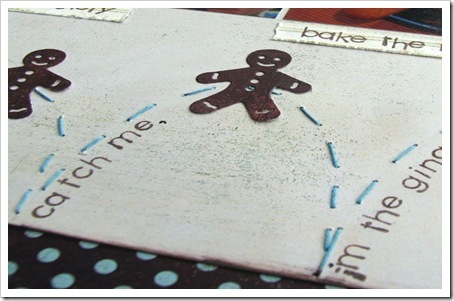 Mel has used the Quickutz gingerbread man die (combined with a little hand stitching, title and photos) to convey a simple story about how her and her two children filled in an afternoon reading and baking gingerbread men. 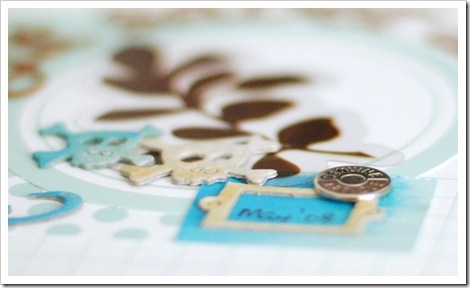 This little die would also be perfect to add on general cooking layouts and ever so sweet for birthday cards. Cutting out and sticking down 82 little coloured pieces of card is probably not for everyone but you have to admit that this Quickutz Nativity Die Set scene is really sweet. You get a set of 6 dies that makes all the characters and the little sheep. 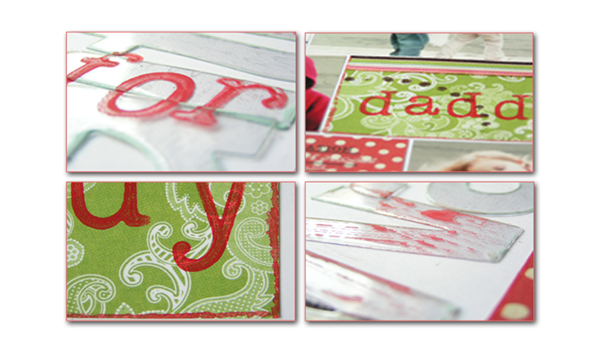 The pieces are able to be embossed with the Quickutz Goosebumps after you have cut them out for added effect. 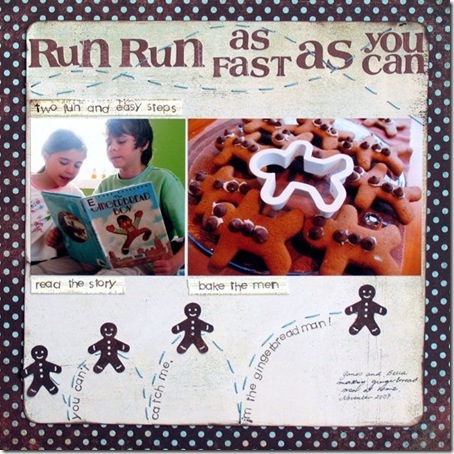 Caz has used the scene to decorate a page on her children's weird re-enactment of the Christmas Story between courses at their Christmas Dinner. 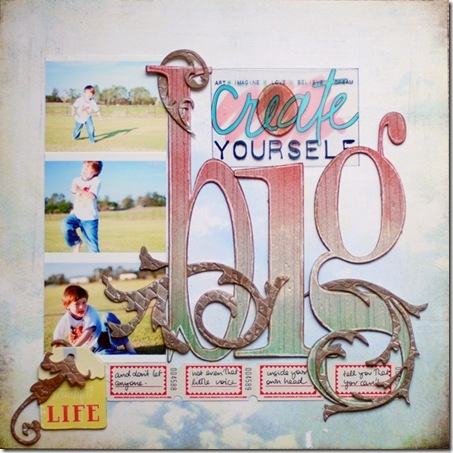 Wendy Morris from Alabama has created this beautiful layout, punching out letters using the Studio Lowercase alphabet by Quickutz. 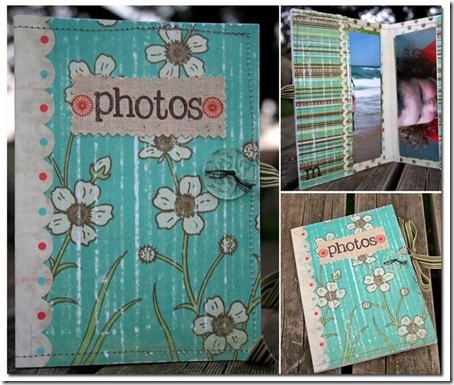 It looks fabulous as a large title over the photograph, especially teamed with all those gorgeous circles and buttons across the bottom of the page (which include Wendy's journalling). 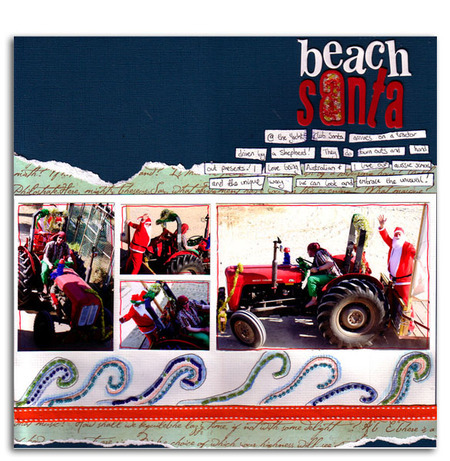 this week we share layouts our design team have created using fabric in both novel and normal ways. Caz didn’t really know her Grandad as he lived in England and she only really met him twice, but what she does remember are his beautiful flower gardens, his love of the kids tv show “Postman Pat” and the sweet smell of his pipe. 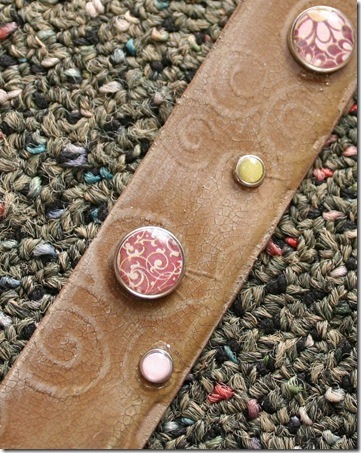 She has used the Junkitz Fall Swatchz as the rough textures and check pattern match the tweed on her grandads jacket. 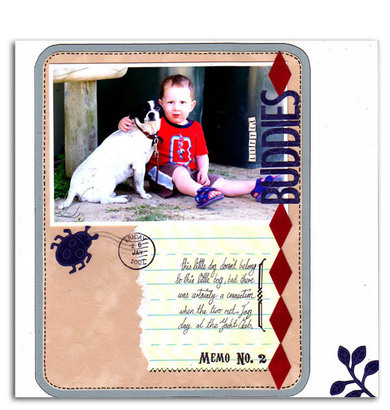 Carolees Creations Twill Letters, Metal Buttons and rough machine sewing finish off this manly looking layout. 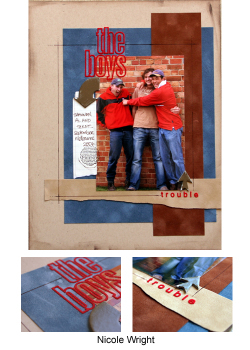 Wanting to keep a very boyish feel to this page, Mel selected a range of denim and red fabric products to work with (Junkitz boy swatchz, Lil Davis Chenille Varsity letters and Junkitz love line canvas tabz). 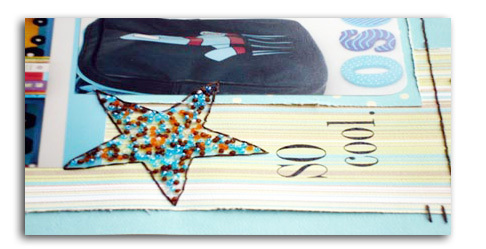 Star shapes were cut out of the fabric and then handstitched into place. The large Lil Davis letters add interest to the title. Rach loves using fabrics and velvet on her page, so she relished this challenge. 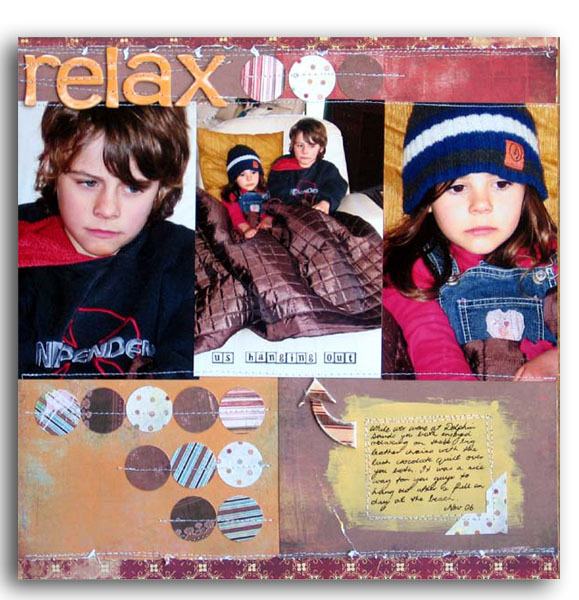 She has layered the velvet onto two sheets of cardstock, and then used it as the focal point of her layout. Another technique is to use velvet paper with a Quickutz or other diecutting tool, it cuts like paper, with no fray, Rach created diamond shames, which draw you to her title which she also made using the quickutz. Finally to finish the layout off, she hand cut one of the lady bugs from the SEI Doodley-Doo Boy Velvet paper, and one of the little branches. Nic knew this photo would be perfect for a hanging for Abby's wall as soon as she saw it. 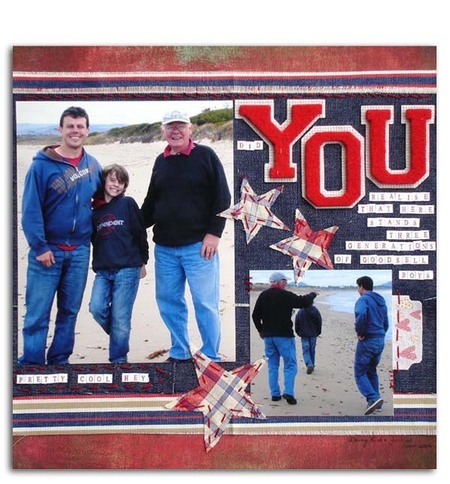 When deciding on materials to use, the full texture of the Michael Miller Memories fabric papers made them her first choice. The fabric papers are full of colour, they coordinate beautifully and they are versatile and easy to work with, as shown in the way Nic used her circle cutter to create the circles within this layout. 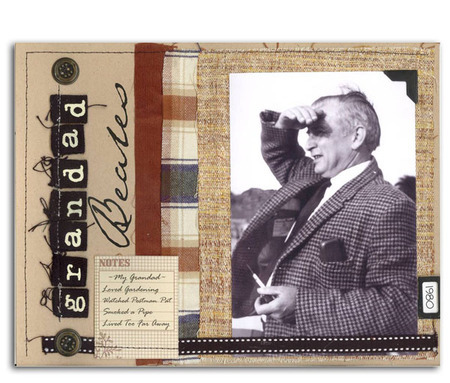 The tweed paper has an especially interesting texture, perfect for a layout to hang above a little girl's bed. 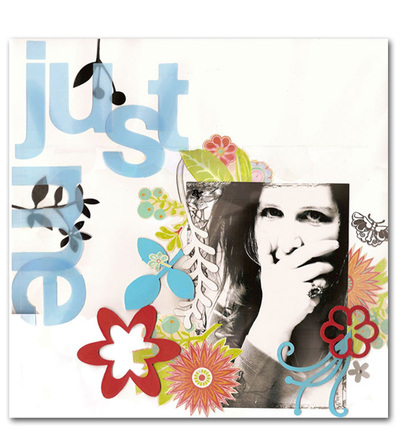 Steph created this way-too-cool canvas for a class she taught earlier this year. 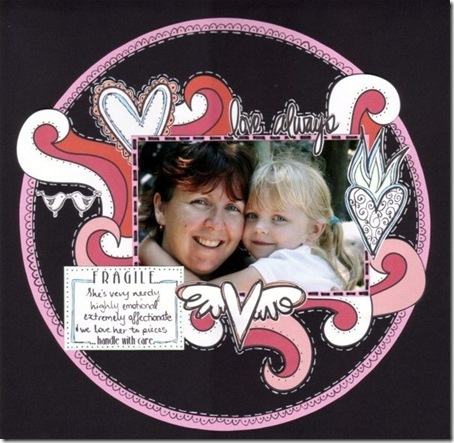 She uses a heap of Michael Miller fabrics in different ways, both radiating out from the uber cool of photo of her daughter in the very centre of the layout, and she has also cut out swirls and cats from the fabric seperately to integrate into her design. 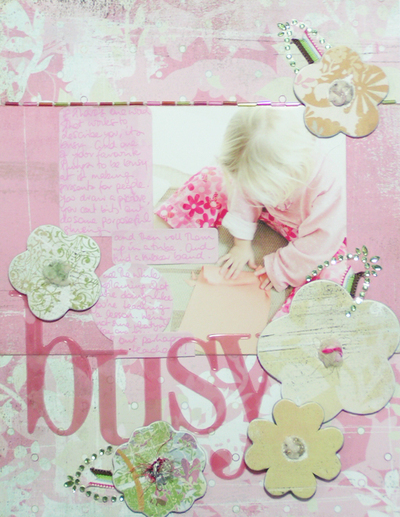 A smattering of cherryArte chipboard finishes the canvas fabulously. Donna considered this month's fabric challenge a 'real' challenge. She had never used the Michael Miller Memories fabric papers and before now had never comtemplated ways that they may be incorporated into a layout. Donna was definately surprised by the strength and versatility of these fabric papers and in a fit of hole-punching madness created an interesting feature by running a length of Basic Grey velvet ribbon down the length of the fabric piece. In keeping with the haberdashery theme, she simply couldn't resist completing the design with a bunch of Heidi Grace Designs heart pins. 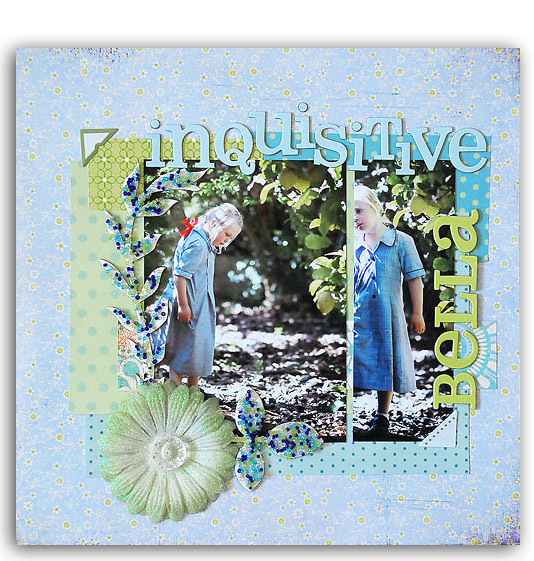 'Inquisitive Bella' is quite a different looking layout...not the usual mix of girlie colours that we are so used to seeing from Donna. Instead Donna opted for a dark and mysterious blend of papers and embellishments along with some cute, yet bold beadifuls by Queen & Co. To create the feel of a darkened garden, Donna covered a few Cherry Arte chipboard branches with the 'Making Waves' beadifuls and a lot of clear drying adhesive. The effect is highly dimensional and slightly quirky at the same time. It was Crazy Hair Day, a fundraising event supporting the World's Greatest Shave at Suz's son's school and she didn't have any coloured hair spray. So she did what any scrapper would do (wouldn't they?) and stuck a load of Scenic Route alpha stickers in his gelled waxed sticking up hair. That was three minutes before they were due at school so there was no time for photos until assembly, by which time his hair was looking a little sadder, but you do get the general idea. 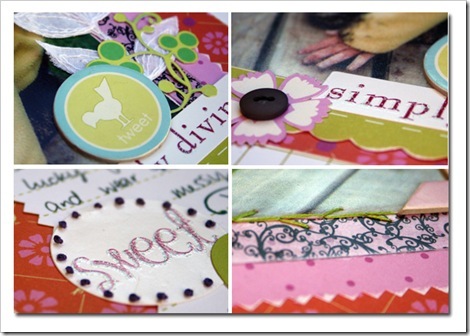 Suz has outlined her Heidi Ghost title with Beadifuls, as well as adhering lines of them down the middle of her arrows for a cute, cartooney feel. 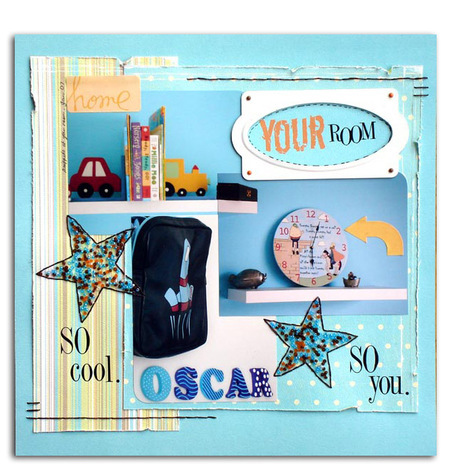 For this layout Mel selected the Birdie Collection from Crate Paper as it worked beautifully with the aqua tones in her great nephew's bedroom photos. To create the stars, Mel handstitched the outline with embroidery cotton and then filled the inner area with dimensional magic and Queen & Co beadifuls (pinky swear). Rach has created this fabulously non-traditional Christmas layout but given it some sparkle with Make Waves Beadifuls by literally making wave flourishs withthem. She's also filled in the 'a' in her Lil Davis framed alpha title. 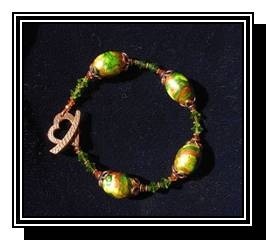 This week the focus is on beads. 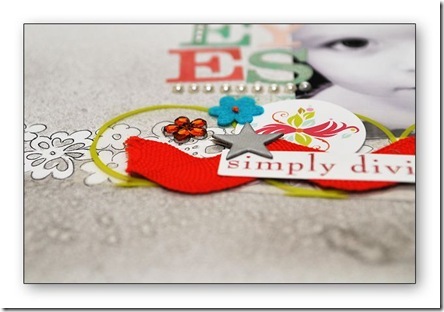 Beads on a layout can add dimension, lustre and style. 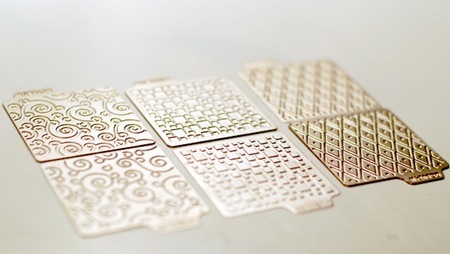 They can be a subtle way of adding sparkle if you're not a glittery type, or they can be used to accentuate patterns or elements of patterned paper or embellishments. These days beads appear in lots of Nic Howard's layouts. She uses them to add dimension and colour. 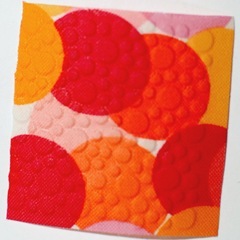 A popular technique is to place a layer of beads along lines in your patterned paper. 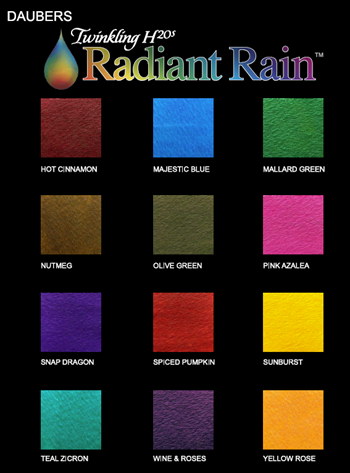 Alternatively you can match the colours of beads to the colours in your papers. That extra layer adds dimension. 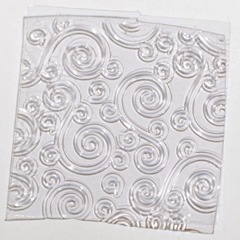 If you are using plainer papers then beads are a fun way to add swirls and lines. Again, pencil draw out your shape, add a line of dimensional magic and pop those beads on. 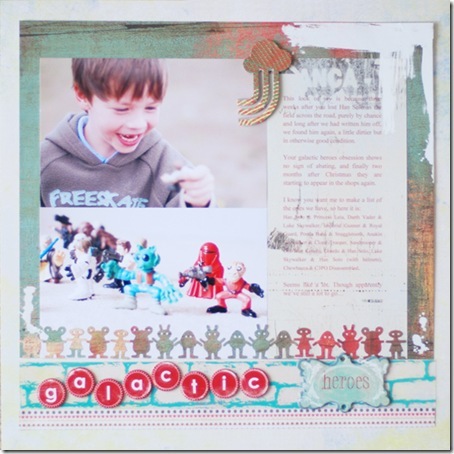 Nic has created this incredibly stunning layout and runs us through, in a step by step, a cool and easy way of adhering and arranging Queen & Co's tiny Beadifuls on your layouts. Step 1. 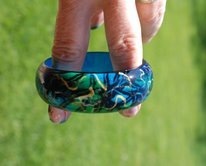 Apply a line of dimensional magic or Papier glass finish where you would like the beads to go. Step 2. Tip your beads into a tray. Place the tip of a sharp pencil into the hole of the bead. Step 3. Touch the bead (which is on the end of the pencil) on to your line of dimensional magic. Do not press hard, just touch gently, and the dimensional magic will 'pull' it off. Step 4. Complete your creation by repeating the above steps. What looks like a very complex creation is really an easy task! Enjoy your Queen & Co beadifuls, available in 13 different themed colors. 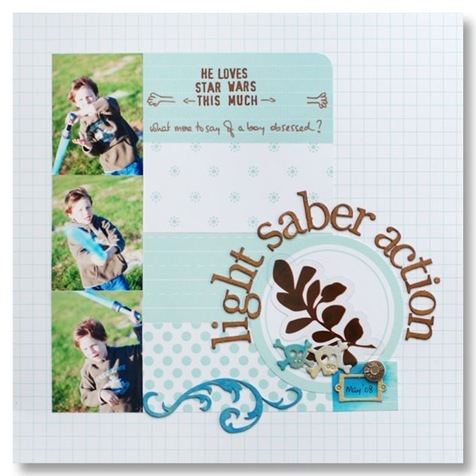 As promised we've returned this Tuesday with a treasure trove of bright, subtle and sparkly layouts from our design team featuring different techniques using the paints in stock at Aussie Scrap Source. 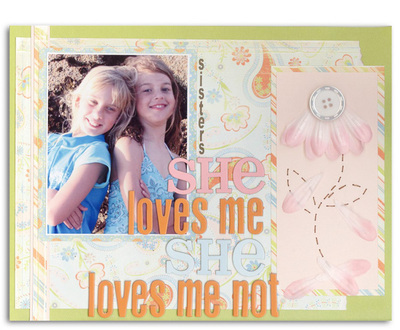 For this layout, Mel combined three paints (Heidi Swapp White and Lil Davis Bubble Gum & Sea Glass) and brushed a touch of each onto the Heidi Swapp diamond foam stamp and then stamped directly onto her layout. Once the paints were completely dry, Mel hand-stitched around each diamond with embroidery cotton. 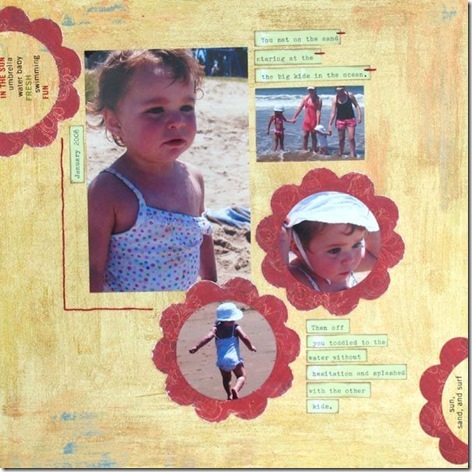 In this layout Mel has used Heidi Swapp cream paint as a background for her journaling. 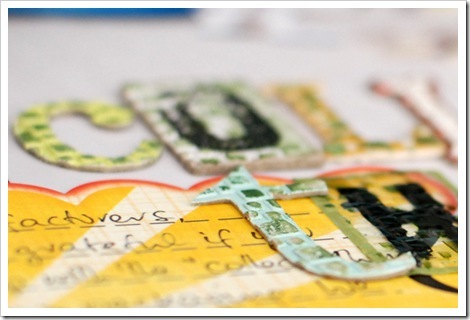 Simply paint directly onto the layout with a foam brush and once dry apply your journaling. 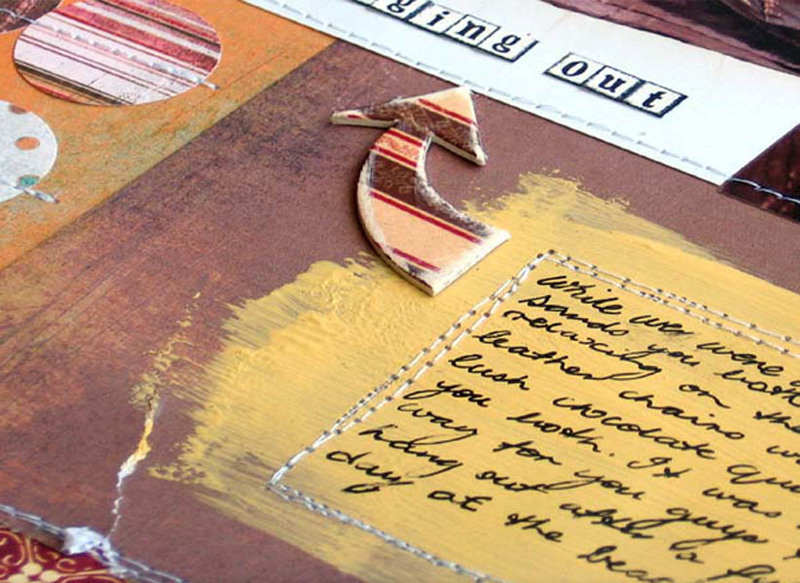 Mel has also machine stitched over the paint to create a more uniformed journaling block. For this challenge Rachel decided to go outside the square and instead of paints she used Hero Arts watercolour pencils. She first stamped my title, then using the coloured pencils, coloured in the letters in three colours, lime green, pink and yellow, then with a fine tipped paint brush dipped the end in water and added to the pencil. The effect is a brighter smoother image, and the colours blend into each other. Rach didn't want this to be too neat so purposefully let the colours blur over the lines to create a melty icey feel to suit her subject matter. This elegant and simple layout, created by Donna, utilises Li'l Davis Glitter Glaze paints in a fairly unconventional way. Donna has covered a Heidi Swapp Ghost frame with several coats of Li'l Davis' 'clear' Glitter Glaze and a single coat of 'Ice' coloured Glitter Glaze. The resulting effect is definitely subtle, but when the light hits it in just the right way, this layout sparkles like you wouldn't believe. Although this doesn't look very much like a painted layout, Suz has used them in several different ways. Firstly she has outlined Heidi Swapp Ghost alphas with the very subtle "Surf" acrylic from the Junkitz pack, and applied Fontwerks acrylic stamp circle with "Coconut". 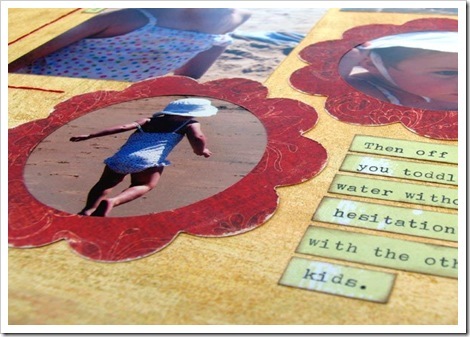 She then hit the layout with Heidi Swapp's Crimson in several places with different applications - the second half of the title with Li'l Davis foam alphas, edging the layout and the patterned paper, and also swiping the ghost alphas with a watered down version so that it dries with a subtle texture. This week we're setting the challenge to the design team to use paint on their layouts. This is just some of the paints in stock at Aussie Scrap Source - Lil Davis does acrylics, metallics, glitter and kits, Hero Arts have cool watercolour paint wheels which give beautiful soft subtle effects, Junkitz have a box of little tubes of really useful colours which are fabulously portable for crops and Heidi Swapp has paints that perfectly co-ordinate with everything else in her range. 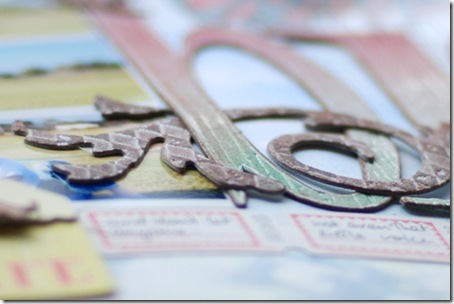 The new release 'Scarlett's letter' papers by BasicGrey feature a lot of foliage images. 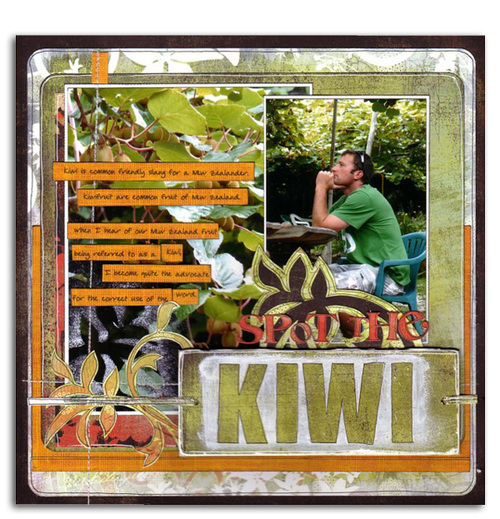 Nic thought it'd be perfect to use with pics of her husband under the Kiwifruit vines. 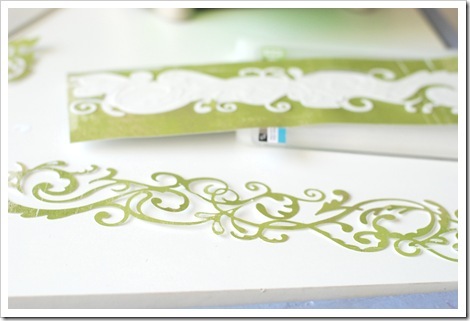 Nic used paint to dry brush a white edge all the way around the edge of the background paper. (The one next to the black). Nic used paint over the top of SEI letter stickers. When she lifted the letters, it left a painted negative image. 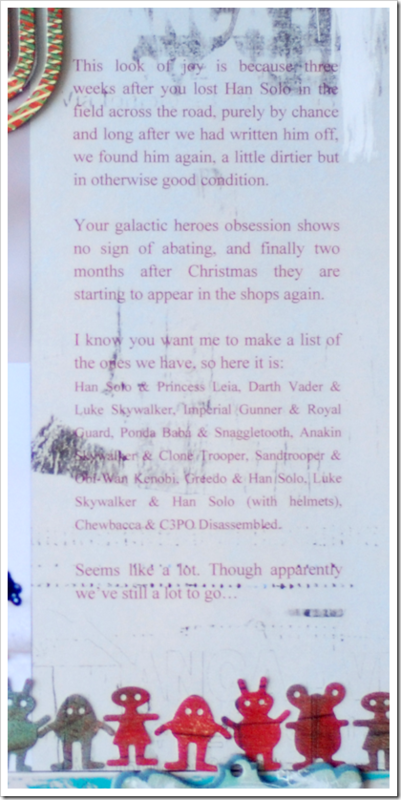 Finally, she cut the foliage image out of one of the 'Scarlett's Letter' papers, turned it over and used it as a mask. Nic then turned it back to the right side and stuck it down to the layout. Check back next week to see what the rest of the design team come up with. A gorgeous array of fabulous flowers and beautiful blooms are what the design team came up with in response to their floral challenge. We hope you enjoy their efforts. 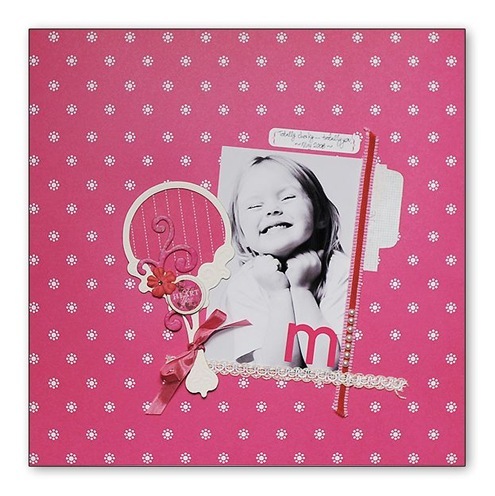 Steph loves doing collages, and the chance to combine CA Floral Chipboard and BG Romani was a perfect match. 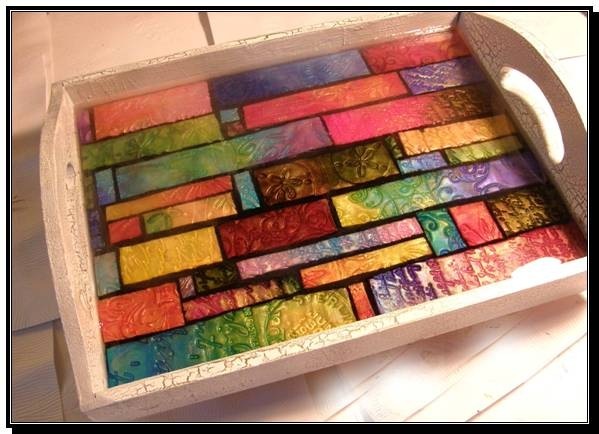 She has painted the Chipboard with Acrylic Paint and applied dimensional fluid to the chipboard to give it a raised effect. 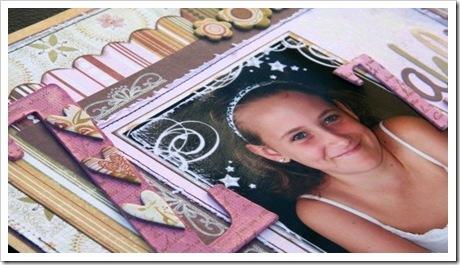 She was also used the natural chipboard without altering the colour so it blends in and compliments the background. With the HS mask Steph has cut that up and placed pieces of the leaves and berries under the Heidi Swapp Acetate Letters. 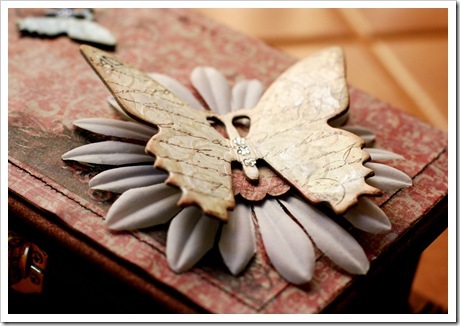 The Cherry Arte butterfly has been stamped on and coloured in with a black zig marker. For the florals challenge Caz chose the gorgeous Lil Davis printed flowers. This one has ‘loves me’ ‘loves me not’ printed on each petal in turn which reminded her of the relationship that her 2 daughters share at the moment. She separated the top layer of the flower, cut it in half and folded half over to make the quarter flower. She then trimmed individual petals from the remaining half and stuck them down as though someone was tearing them off and throwing them to the ground. 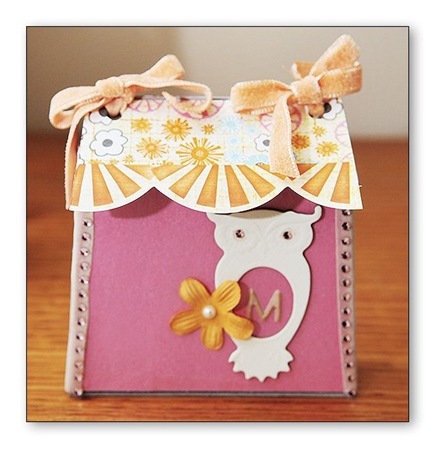 All paper is from the Crate Paper Carnival Collection, chipboard title by Heidi Swapp. Donna makes no secret of the fact that she is a huge SEI fan. It was therefore no surprise to anyone to see Donna reach for her stash of SEI and pull out these gorgeous Puffilicious flower stickers. 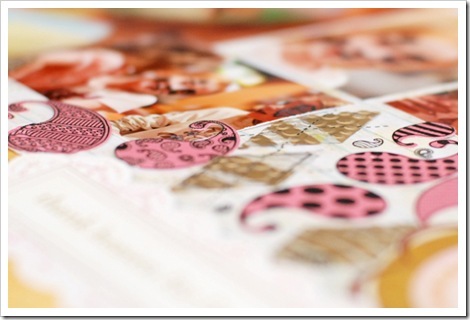 Donna has combined the 3-dimensional stickers with patterned paper cutouts taken from the SEI Penelope's Potpourri range. 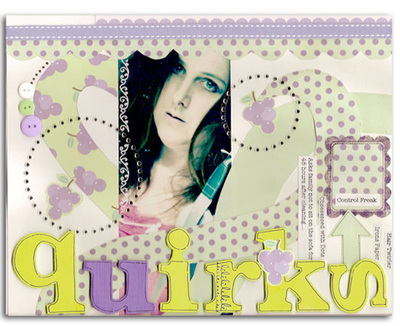 The result is a fun and funky layout with plenty of dimension, glitz and gloss. 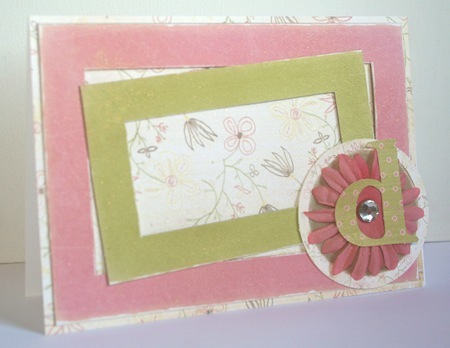 Mel combined a variety of techniques to create a variety of finishes for her flowers on this layout. 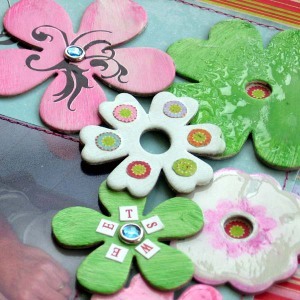 To begin with she painted the Deluxe Designs Plain Jane chipboard flowers with a selection of paints (taffy, pistachio and white) and added a splash of bling, mini alphabet letters, hand cut circles, rubons and dimensional magic to each individual flower. A combination of Basic Grey Gypsy Romani patterned papers was all that was needed to complete the page. 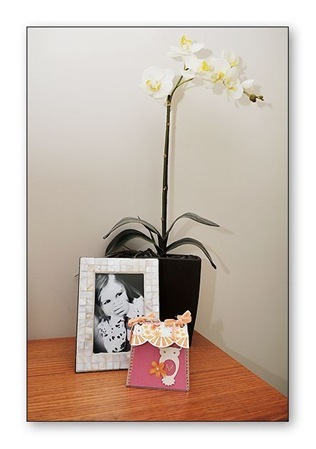 Nic has always enjoyed using the Heidi Swapp Florals. 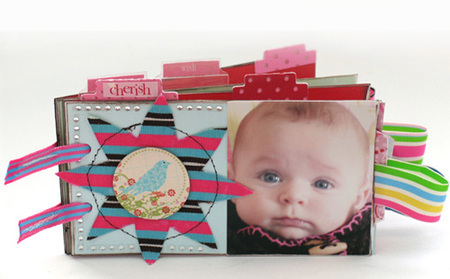 The bright colours give life to any layout and they are incredibly easy to use. 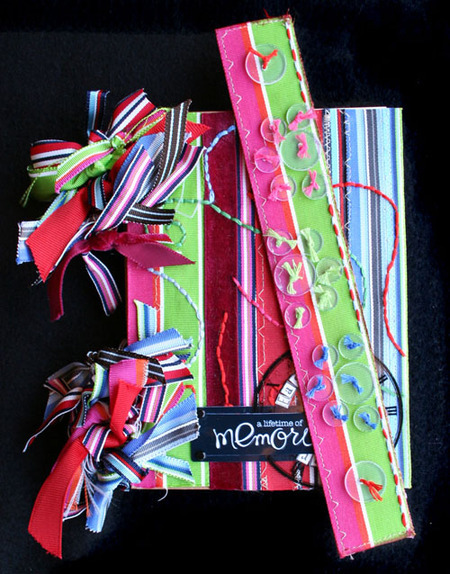 She has combined 3 different colours in her layout "I Want.." Some of them have been sewn through, some have been kept whole, and some have been folded in halves or quarters. Punched circles from bright Scenic Route papers and SEI Rhinestone brads finish this layout off nicely. 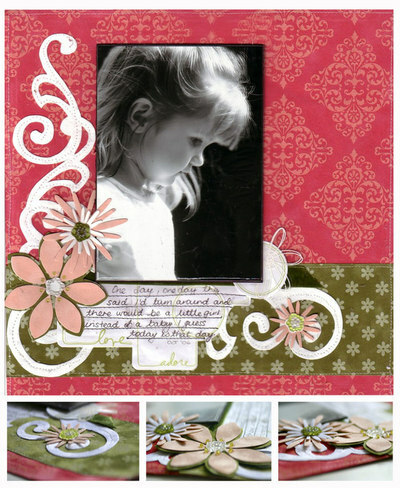 For the floral challenge Rach used the Junkitz Flowerz, using the Ivory ones. 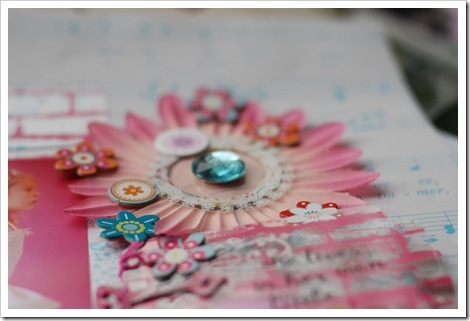 She decided to do something different with the centres of the florals and created them by folding over Strano ribbon that matched the colours in her photo. She then secured them in places with an SEI Pearl Brad (citrus). 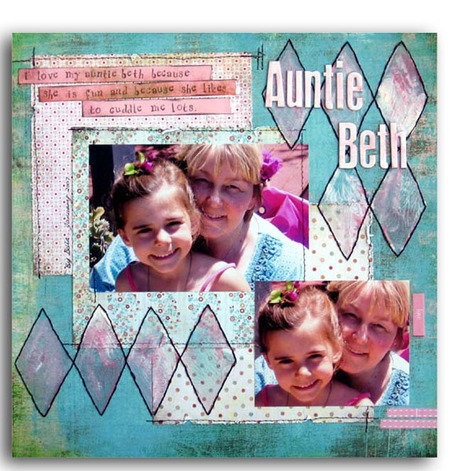 In doing this she has created a border feature across the bottom of my page, as well as balancing the layout with a large floral in the top right hand corner. Flowers are everywhere and whilst they may change colour, size and shape, they never go out of fashion entirely. 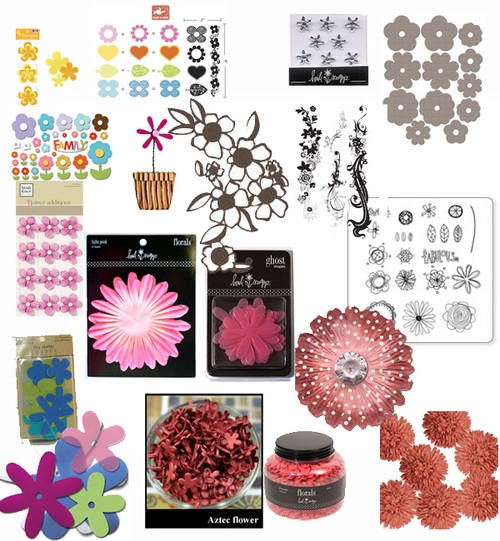 Here are just some of the flowers we have in stock at Aussie Scrap Source. We're challenging our design team to make beautiful things with these flowers and more, and come back next week to share their creations with us. Suz kicks off this week with this layout using some of the newest floral papers on the market, BasicGrey's new Perhaps range. She's covered Deluxe Designs Plain Janes with them, and knotted up the co-ordinating Perhaps fibres to make the centres of the flowers. Leaves of Heidi Bling and Strano ribbon and a string of Magic Scraps bugle beads finished off this soft floral layout beautifully. Check back next Tuesday to see what other fabulous florals the design team cultivates. 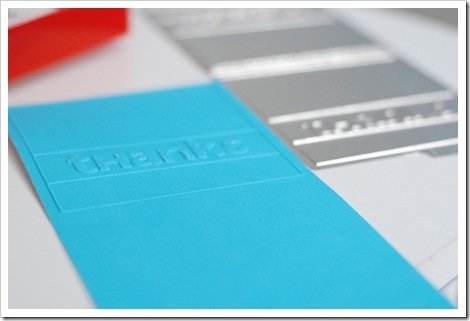 This week we are challenging the Design Team to stretch the limits of working with acetate. 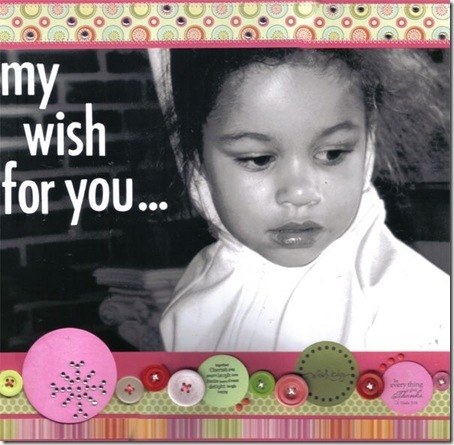 These include all the fabulous Ghost and Credit Card products by Heidi Swapp, the beautifully co-ordinated Heidi Grace translucent plastic embellishments, and darling Queen & Co sequins and beads. stamping on them with stazon. 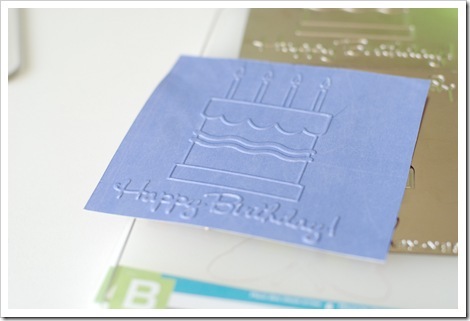 most of them won't melt with embossing either! 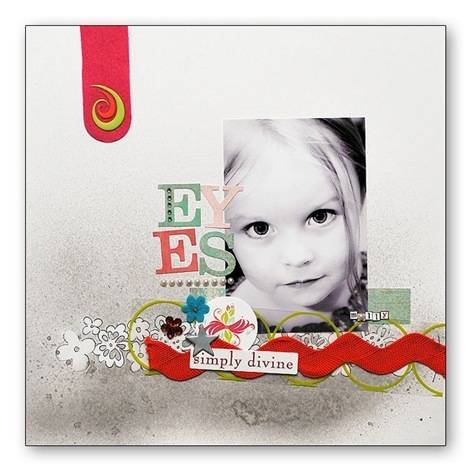 Suz played with the 'eyes are windows to the soul' quote in this layout and has gone to town with the acetate products. She has used a Heidi Swapp Ghost frame to overlap the photograph bringing the focus where she wants it - to her daughters rare grey eyes. 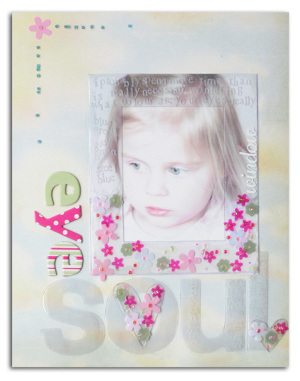 She stamped journalling on the frame using Hero Arts alpha stamps and Stazon White Ink, one of her new very favourite products. 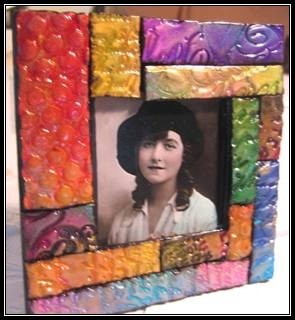 She covered the bottom half of the frame and the Heidi Ghost Hearts in dimensional magic and embedded Queen and Co. flower sequins and beads into them. These are the 'Scrap in the City' range of pinks and greens. 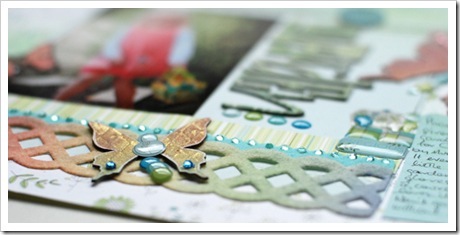 The dimensional magic dries clear and gives the embellishments a further sheen. She finished off the title with Heidi Swapp Apple Pie rubons, which transfer perfectly onto the plastic surface of the ghost frame. Finally she applied another fine trail of dimensional magic to the top corner of her layout where she applied more Queen & Co. beads and a flower sequin. Velvet: we challenged the design team! 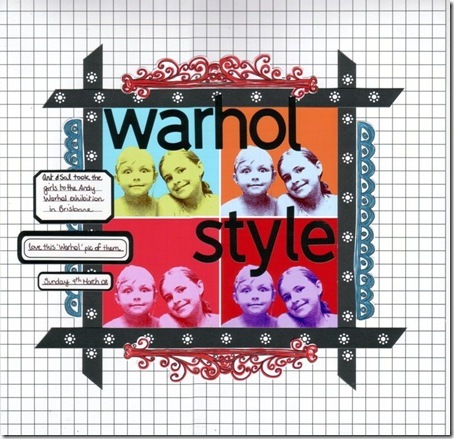 The design team rose to the challenge of the SEI Velvet Papers, using them in an array of different styles and techniques. Mel chose to handcut the individual flower shapes on the SEI velvet paper and then respositioned them on the left of the layout to create smaller flower clusters. A brad in the middle of each cluster finished off the look. 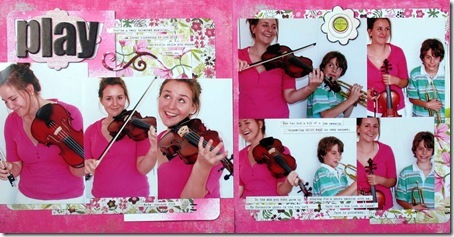 By using co-ordinating rubons also from the SEI range, it was easy to bring the page together quite quickly. Steph Caskey-Devlin has cut the velvet into hand designed swirls and a decorative border at the top of the page. 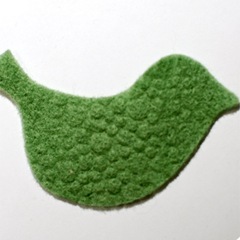 She used the Sassafras Lass stamp to stamp onto the velvet to create a text box and also used the green velvet to create an arrow. 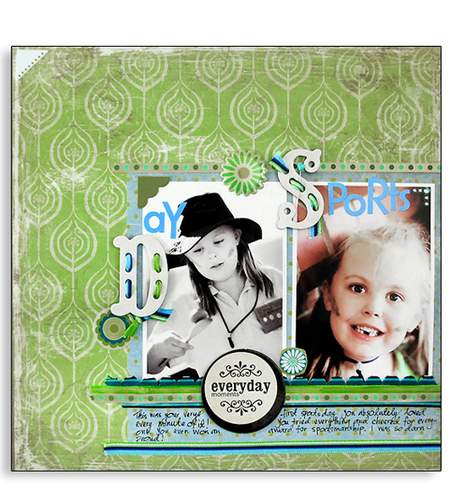 Rach has used the SEI green velvet as the base for her layout and attached all her elements to the velvet, creating a soft look. Yo ho ho. A mix of cherryArte patterned paper and SEI velvets were Suz's choice for this page about Alex's new pirate dressup. 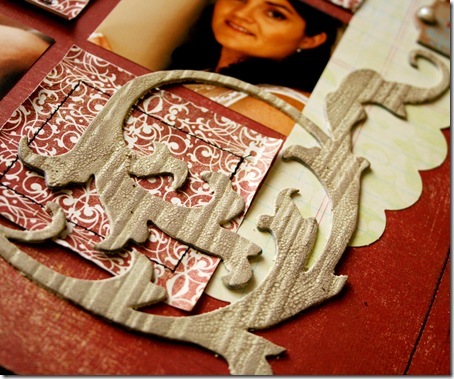 She has used Granny's Kitchen velvet to cover the ever popular BasicGrey monograms, and has also embossed the smaller letters with her Quickcutz. Punched circles from the velvet paper are used as embellishments in Li'l Davis metal frames, reminiscent of a pirate ships' wheel, apparently(!). 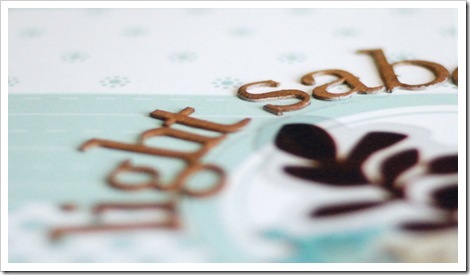 Caz hand-cut the title using SEI velvet paper in Coconut. The beauty of this velvet is that you can print your title on the back in reverse and then just cut around the outline. Caz then printed the words 'not always' on the front of the velvet and cut out a tag shape. 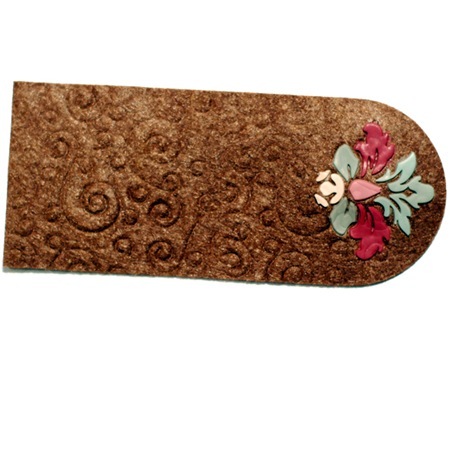 Donna has created a simple but elegant accent for her page by tearing SEI velvet into small pieces, adhering them to a Plain Jane Chipboard Bracket, then machine stitching along its entire length. To further emphasise the dimension and texture of the velvet, as well as adding a touch more femininity, she has added a number of Hero Arts Gemstones following the 'lines' of the bracket itself. Complementary to the velvet look, Donna has inlcuded a Heidi Swapp fuzzy rubon which is velvet-like both in texture and appearance. 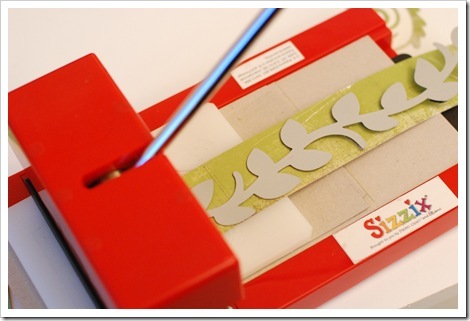 Nic Howard has cut a flower out of patterned paper and used this as a template to make her own flowers. She drew on the back of the velvet which is easy because it's smooth and paper-like. 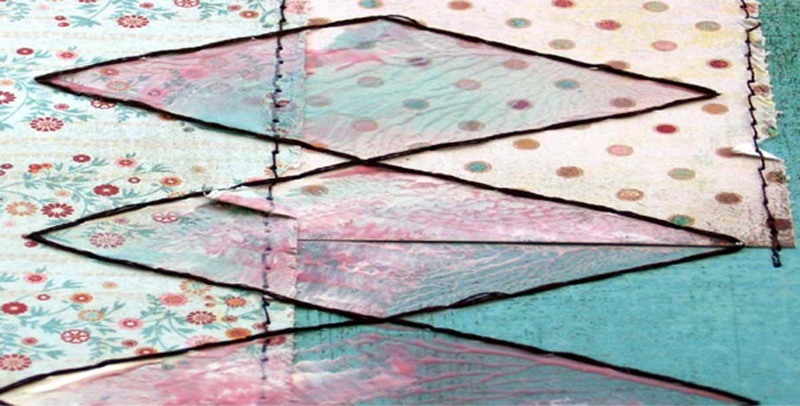 She machine sewed over her scrolls to create definition. 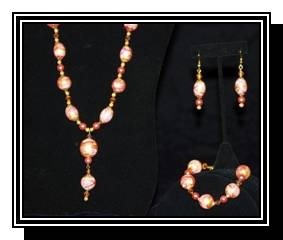 Finally, she attachd beads and gems for added sparkle to her handmade flowers. 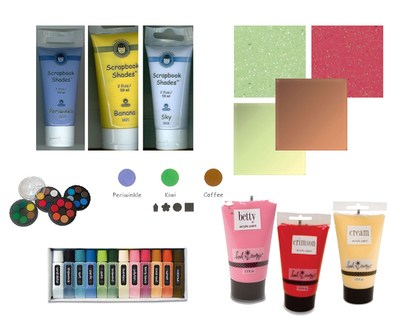 This week we are challenging the Design Team to each create a layout using the gorgeous range of Velvet papers from SEI. 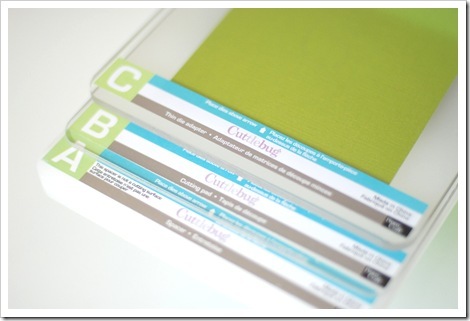 These papers can add a touch of softness and texture to your scrapbook page. 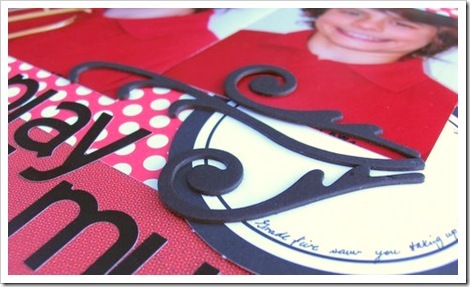 Here are a few ways to inspire you to use velvet on your page. 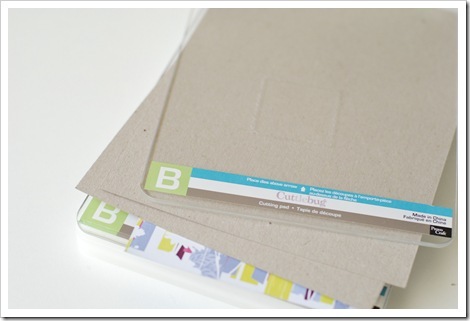 As cardstock or patterned paper - an easy way to use velvet paper is to simply use it as the base of your layout as you would cardstock or patterned paper. Cut shapes - draw or print the shape you want on the back of your velvet - flowers, stars , hearts, and then cut them out and attach to the page. Tear it - sounds a little hard!? Not at all. 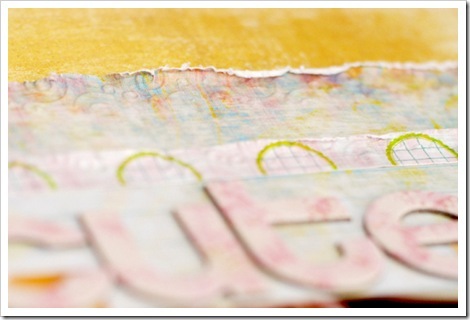 The velvet paper is really like paper, tearing it is easy, and adds a fabulous texture to your page. Draw on it - most pens will work on the SEI Velvet paper, it's just a matter of picking your design or working out your journaling and then transferring it on to the velvet. 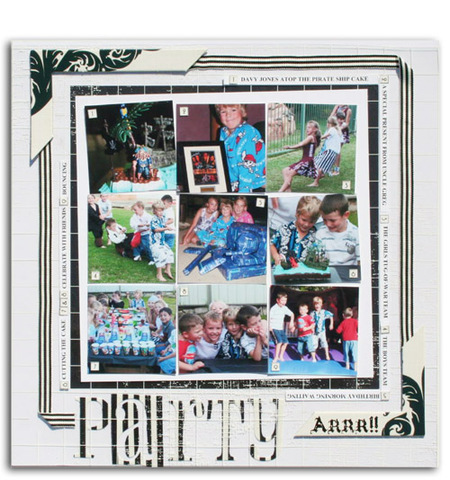 Print your photos on it - some of the lighter shades work fabulously with a black and white photo printed directly onto the velvet. 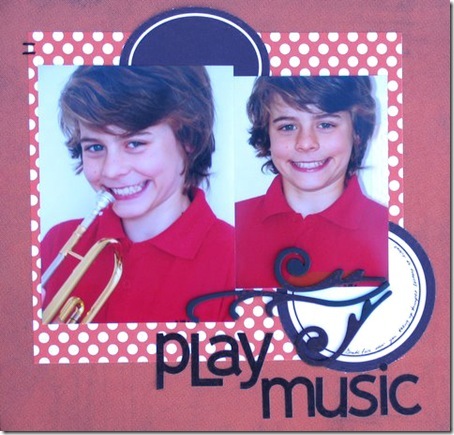 In this layout "The Boys", Nic Wright has created a manly feel by choosing dark rich colours in the velvet. She has used the velvet as if it were cardstock, as well as tearing and drawing on it. Decide on the design for your layout and then cut the velvet to the required size - the velvet can be cut with a trimmer or craft knife. 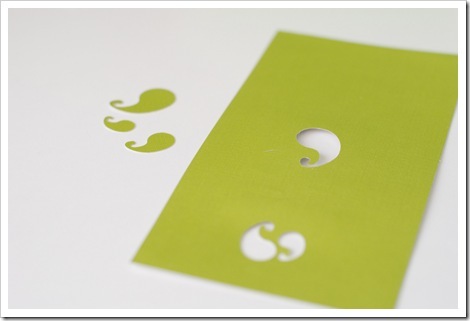 Attach it to your page using a good double sided tape - glue will show through so it is best not to use it. Tearing your velvet is easy and just like tearing paper. Choose how thick you want it and rip away. 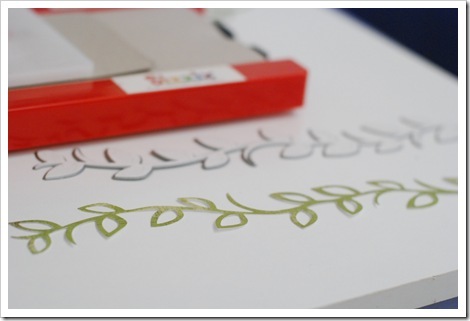 Nic has drawn on her velvet to create a border for her page, simply using a ruler and brown pen. 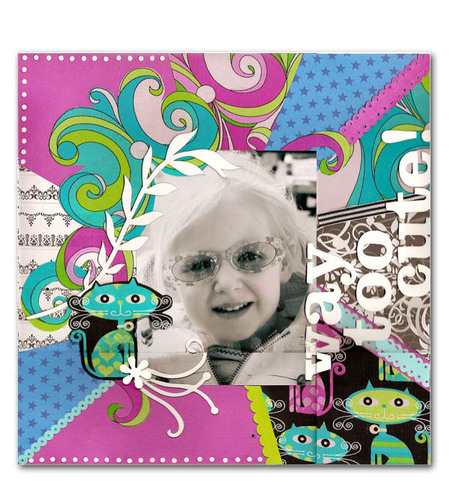 Heidi Swapp Fuzzy Rubons attach easily to the Velvet, and also add a bold and fun title. Come back next week to see what the rest of the design team have come up with.